Do we really need to follow the fabric layout and construction order in the pattern guide sheet? All patterns (except for Marfy designs) come with a guide sheet offering a suggested fabric layout and instructions to guide sewers through the construction process. While it is wise to study the information to identify all the pattern pieces and how they fit together, the layout and order of construction can often be changed for more efficient use of your sewing time and easier handling of your fabric. Do you have sufficient yardage and is the fabric wide enough? This is especially important if the pattern has been altered for fit. 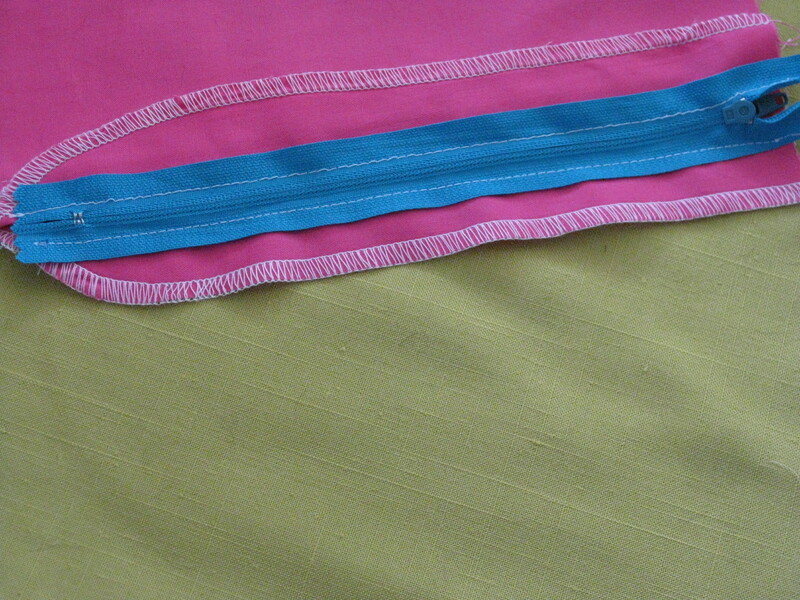 The fabric yardage required can also be affected if wider seam allowances and hem allowances are needed. 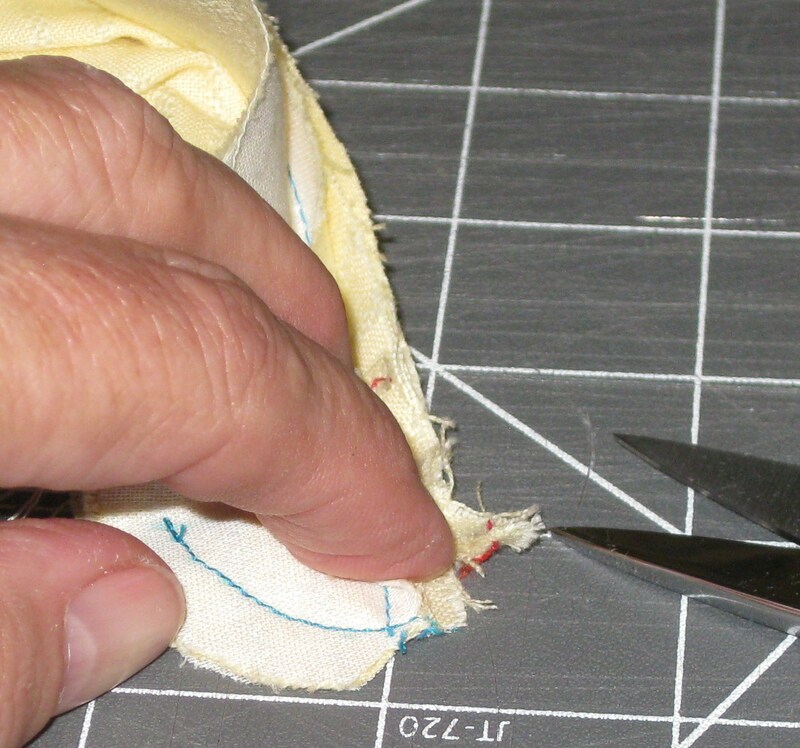 Wider seam allowances can be required if fabric is likely to fray easily. Does the fabric have a nap or one way pattern? If not, the layout may be changed so less fabric is needed. Facings and bindings may be able to be cut from a similar weight but different fabric as they will be on the inside of the garment. Similarly, does the fabric have a pattern or weave which needs to be matched? Many patterns state that they are not suitable for one-way designs; however, it can still possible to use such a fabric provided extra yardage is available. Using a single layer layout is really the best way to maximise success when matching prints and patterns. Will the fabric be easy to work with? If it is likely to fray easily, fusing the edges of each piece with a thin strip of fusible interfacing may be necessary so this does not occur. With very loose weave fabrics, overlocking the edges is often insufficient and the stitching can actually fray away with the fabric. Does the fabric have enough body to support various elements? 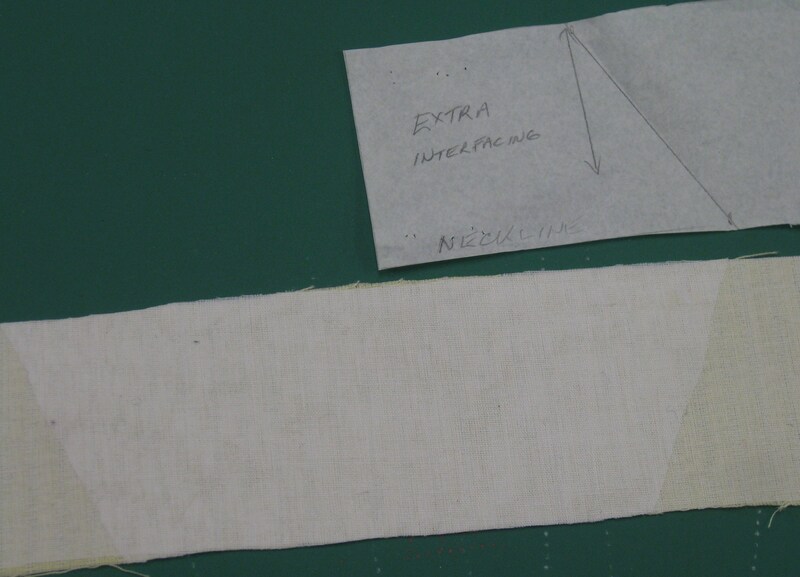 Different areas of the garment will often need different types of interfacing and the instructions suggest the very bare minimum of interfacing as a guide only. Does the garment contain construction elements which you have not attempted before? Even if you have had experience with the included techniques on other garments, it is really worthwhile to practice on scraps of the fabric before tackling the actual garment. Is the fabric easy to press? 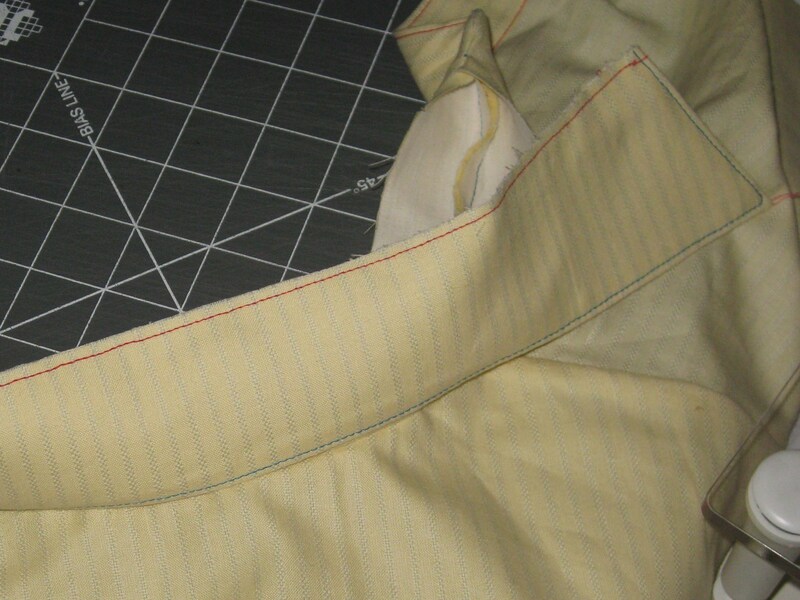 If not, pressing each seam/detail as you go is doubly important so that when the garment is finished, a light steam may be all that is necessary. Does the fabric mark easily when being pressed? 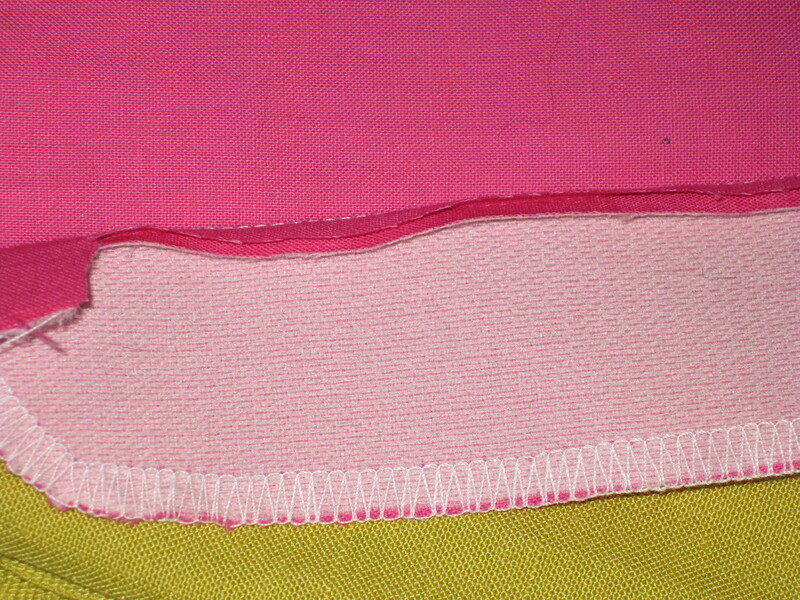 Testing how the fabric behaves when seams, hems, etc are pressed is important so that a more appropriate technique can be chosen if any problems are highlighted. 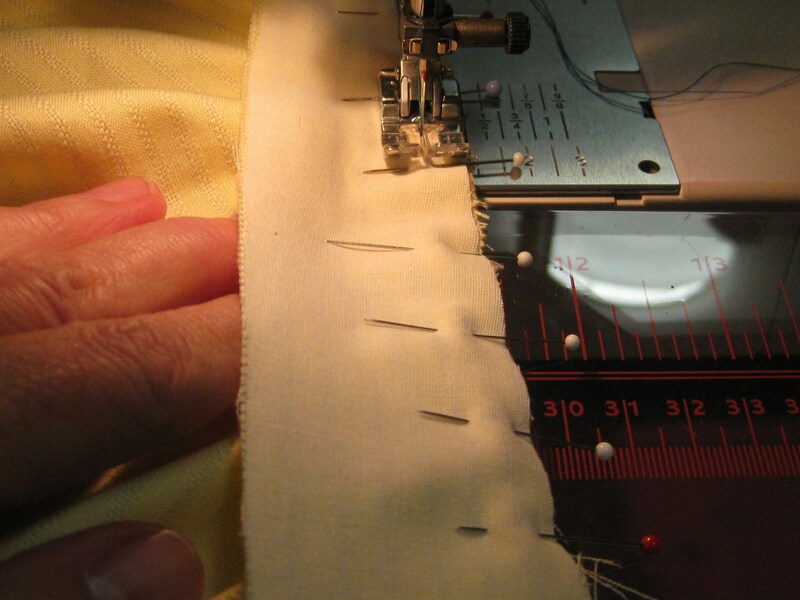 When sewing garments in smaller sizes, it is often much easier to change the order of assembly to minimise the wear on the fabric if it has to be manipulated in a small space. For a waisted dress, or a garment with a band joining separate pieces, these elements should be constructed for the front and back and the zipper installed before side seams are joined. 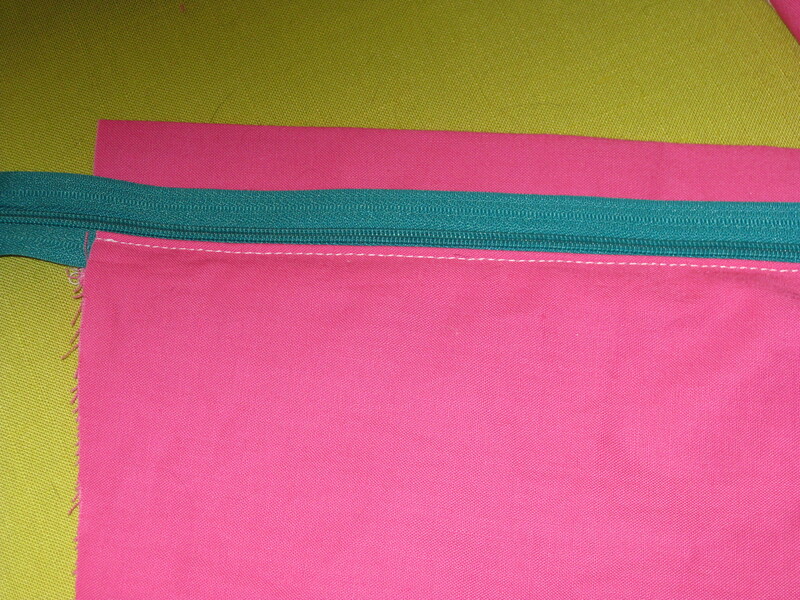 Simply leave the last 5cm/2″ of each horizontal seam unstitched until the zipper is in place. 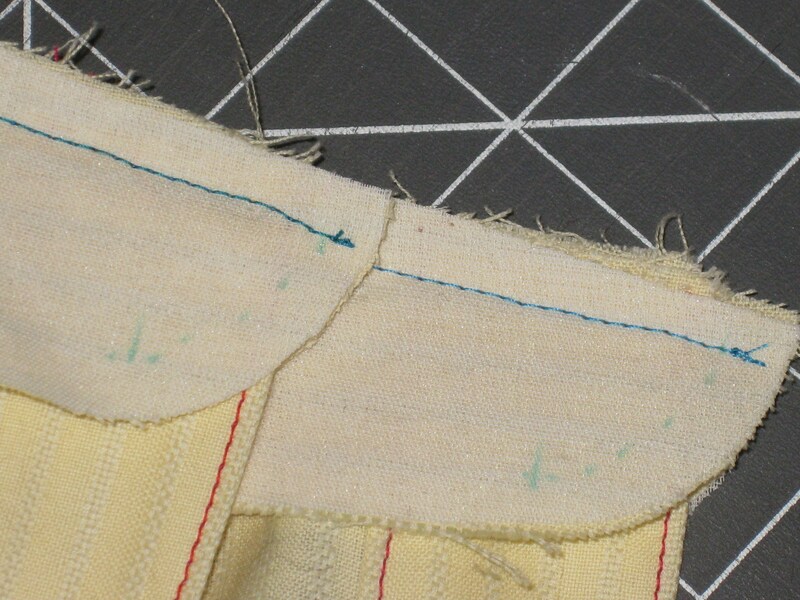 Vertical seams can be sewn and pressed and the remaining horizontal seams finished as mentioned in the guide sheet. If any elements are repeated or mirror imaged, complete them in tandem. This is particularly important with welt pockets, bound buttonholes, patch pockets, etc. so that they will be the same size and be positioned properly. 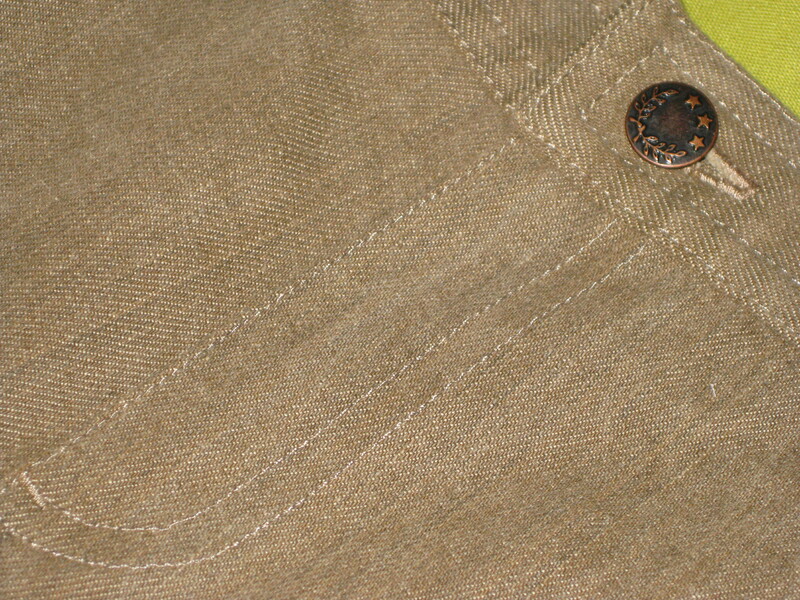 Check that buttonhole positions are going to suit the body of the wearer and change them as needed. complete at the same time all elements which must match. I hope this information is helpful as you start your summer projects. Fabric is a fluid medium. It will move and drape according to its thickness and weight. The outer appearance of any garment is greatly affected by the care taken to provide the correct inner structure for the fabric and style of the garment. There are many choices to be made. Hopefully, this information will help in evaluating the desired effect for each garment and in making your decision on what will work best for your project. Rows of machine stitching will also stiffen fabric and can be used on under collars in place of hand pad stitching sew in interfacing. flanelette (be sure to wash it first in hot water to deal with initial shrinkage). In this blog I will share the methods that I find work best for me. 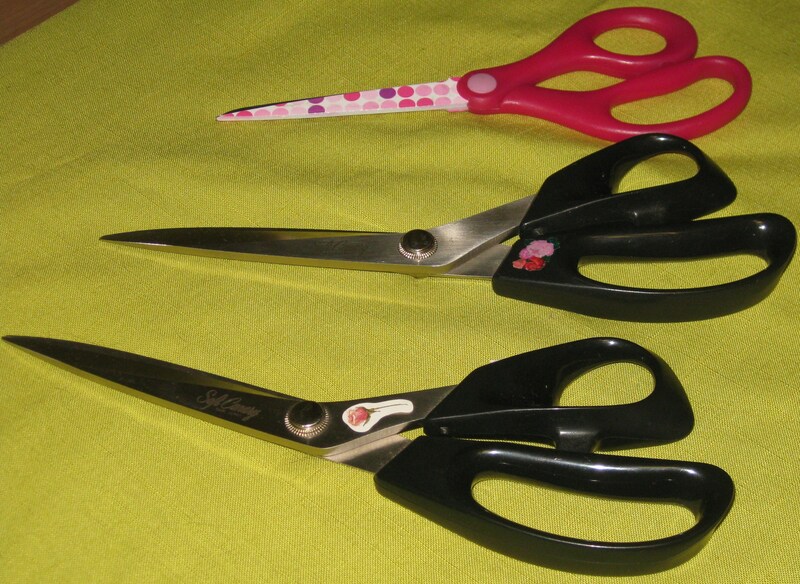 I most commonly use the cut on fly to achieve a flatter finish over the tummy. 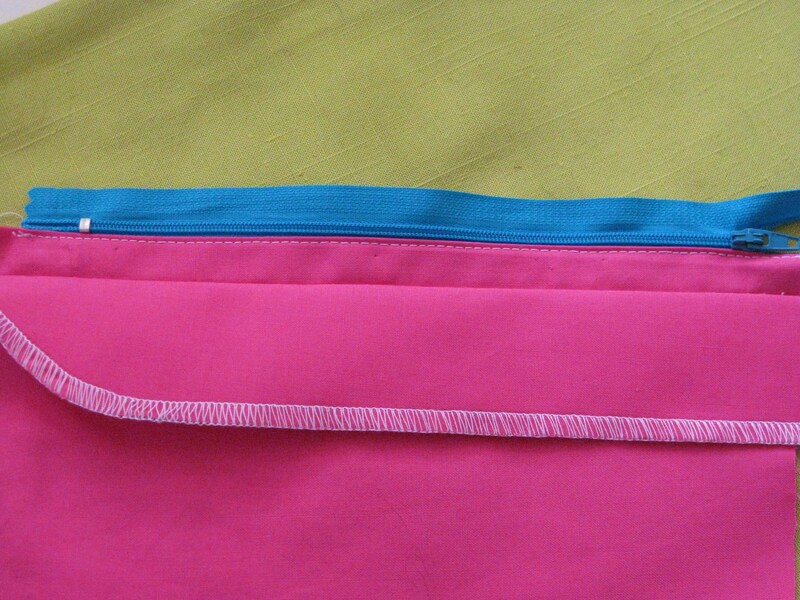 Fly zipper with cut on facing gives a flat finish with minimal bulk. If I am making jeans, I use a much softer fabric for the fly and zipper shield. 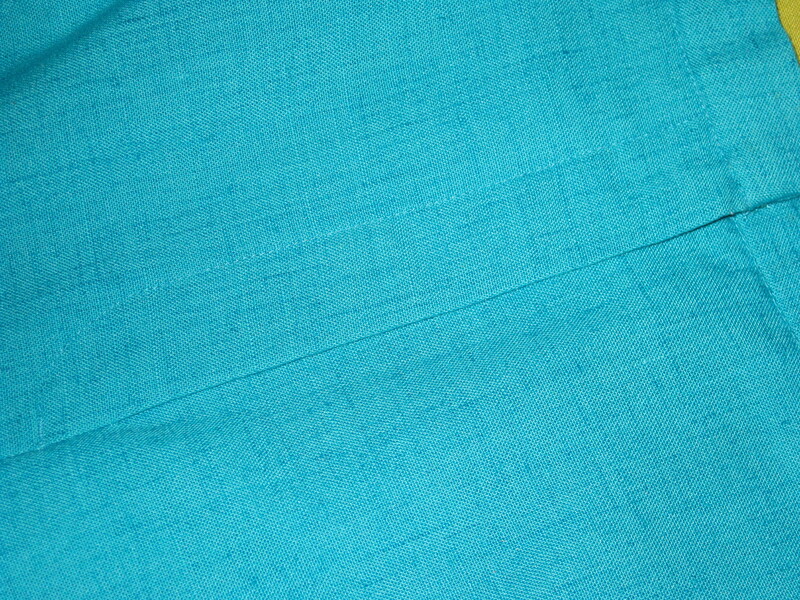 Soft cotton used for fly facing. Some of this information is contained in the guide sheet of patterns; however, to make installation easier and flow better, I have changed the order of some steps. A fly zipper can be inserted to be opened from either the right hand or left hand side. 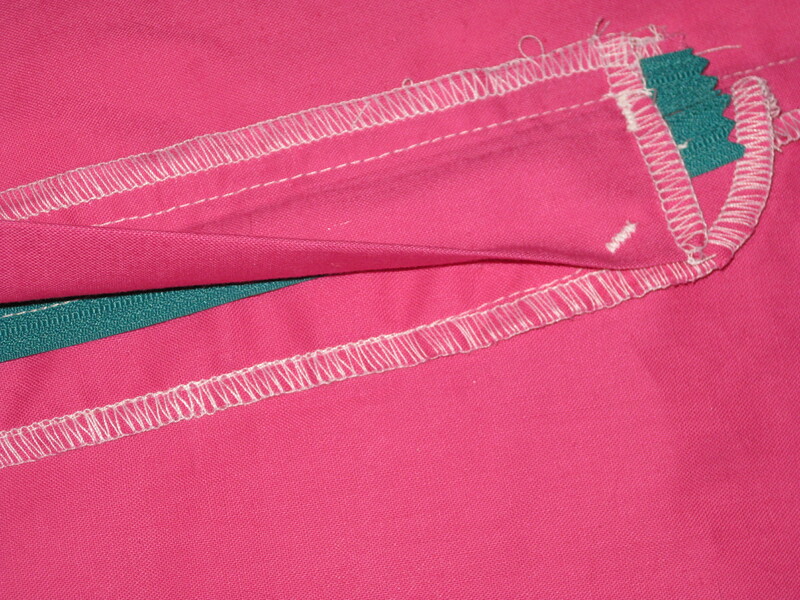 Traditionally women’s pants the zipper fly is placed on the right hand side and for men’s, on the left. Ready-to-wear women’s jeans often have the zipper on the left hand side. None of this really matters when we can sew our own clothes because we can choose whatever side we like! Except for jeans, most commercial patterns for women’s pants are designed with a cut on fly and use a regular dress zip. 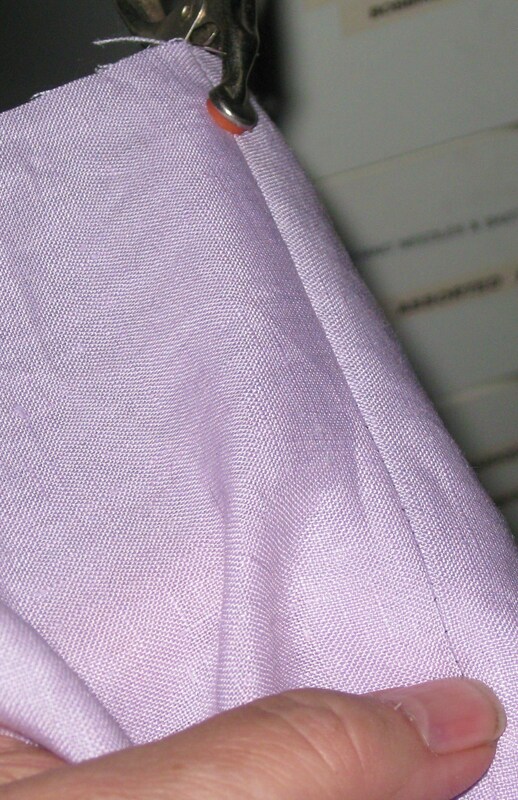 This technique minimises bulk on the front of the garment. Many ready-to-wear garments are designed with a traditional separate fly facing which can be either made from lining or, in lightweight fabrics, from the same fabric as the pants. Tailored pants usually have a regular dress zip. Jeans most often have a metal zipper and zipper shield. If you would like closer fit or wear your pants below the natural waist, the traditional fly with separate facing may give a closer fit – necessary with a lower waist position. 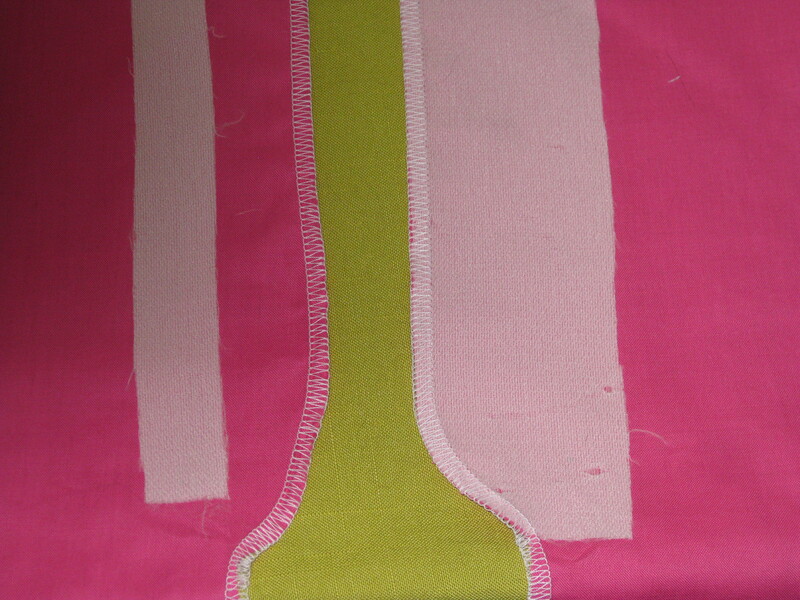 Add width to the centre front seam allowance where the zipper will be set. I usually use 2cm/ ¾”. To convert a commercial pattern with a cut on fly to a separate fly, changes will need to be made to the commercial pattern with the addition of a fly facing, zipper shield and extended waistband. The centre front can be either of the straight of grain or slanted inward slightly. The former allows for a little more tummy room. If you would like to slant the seam, draw a line from the top of the seam (waist area) to the dot marking the lower end of the zipper. 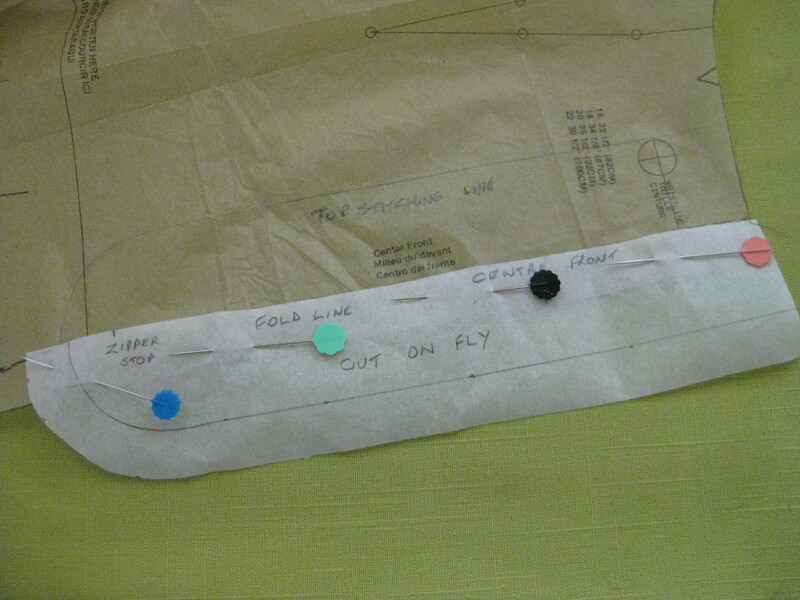 To alter a pattern to accommodate cut on fly, trace centre front and mark bottom of zipper. 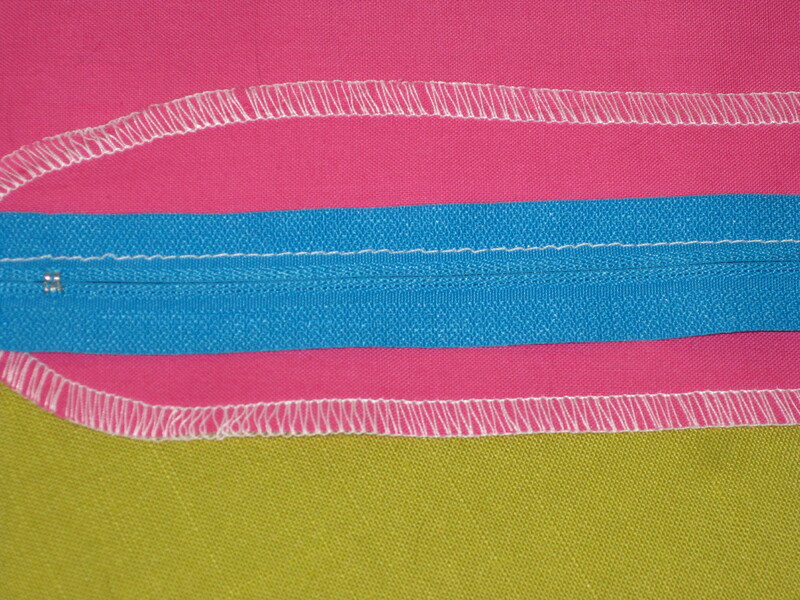 Trace the topstitching line and add a line ¼” beyond. Flip this pattern piece over and align the centre front lines. Mark the centre front fold line. Draw desired width of fly extension and line up CF markings when adding this to the front of the pattern. 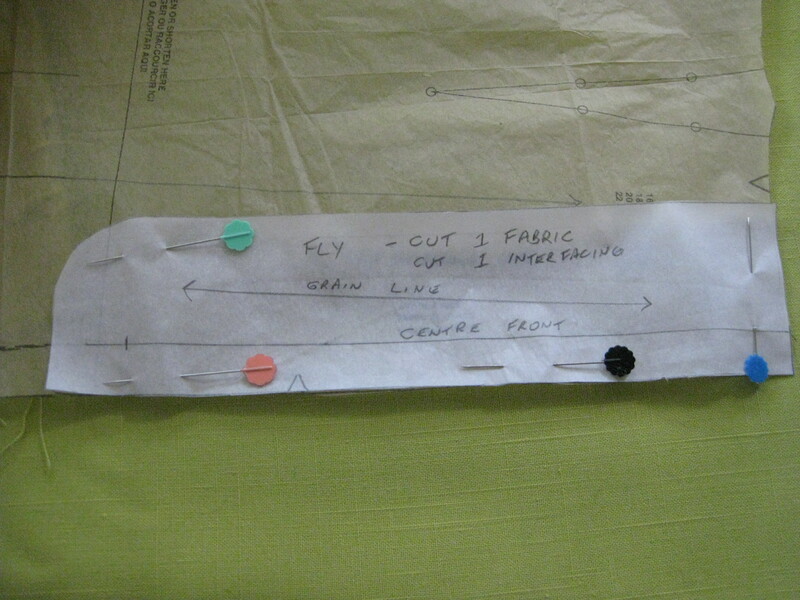 Use fly extension to make a pattern for separate fly facing which will be sewn at CF. Interface the fly facing and finish the outside edge. Interface cut on fly facing and over CF on opposite side. For pants with a cut on facing, interface the underlap with the interfacing extending over the centre front seam on the side of the pants where the visible fly stitching will lie. Shorten the zipper if necessary. 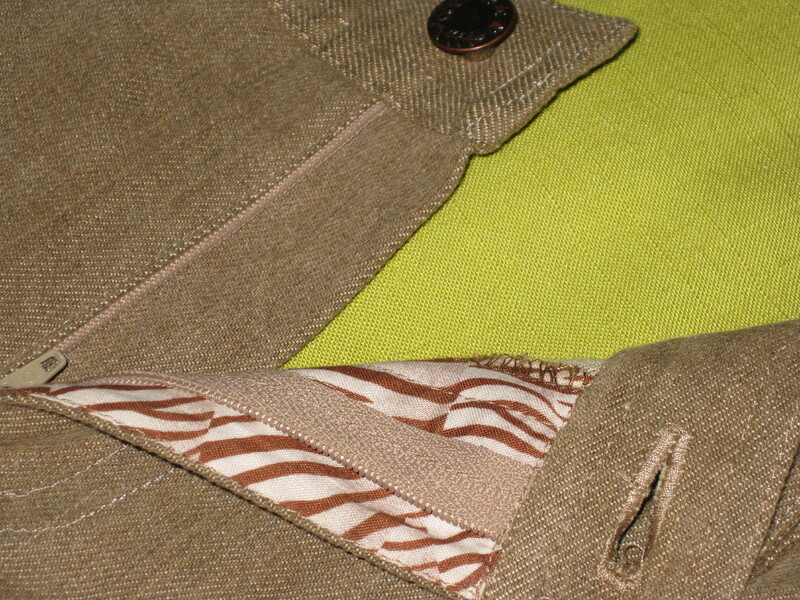 For dress zips, use a longer zipper than the pattern requires. Metal zippers should be as close to the correct length as possible. 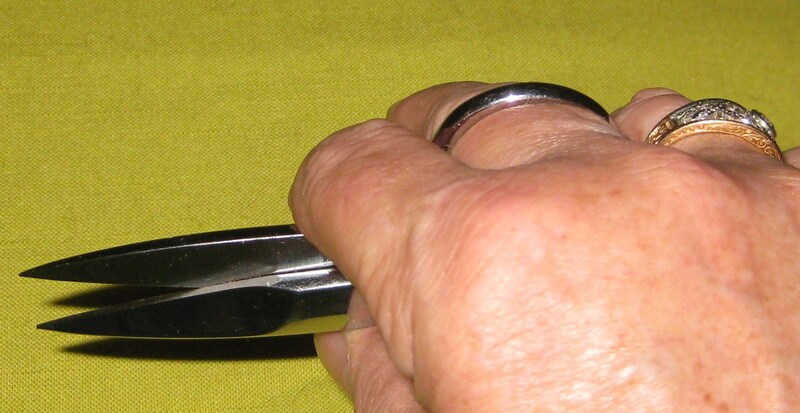 If it is necessary to shorten a metal zip, do so by marking the desired length at the top of the zipper. 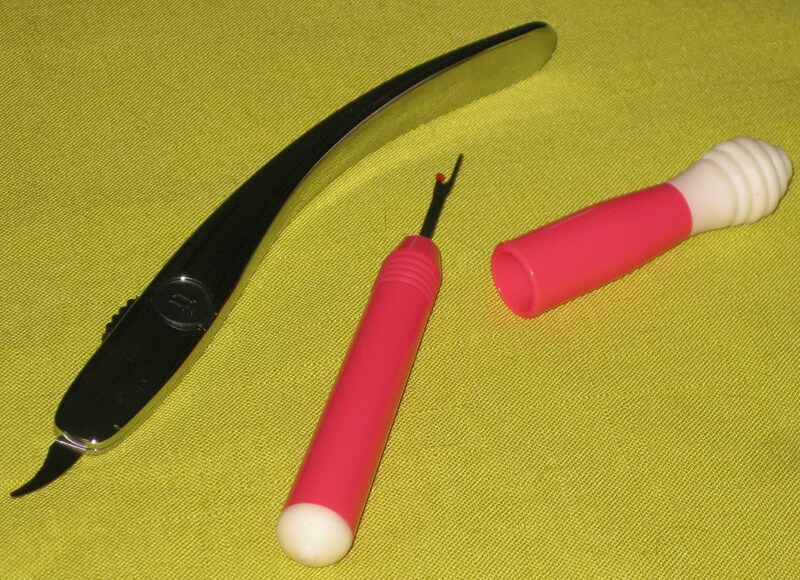 Carefully remove the metal stops (pointy pliers are good for this) and pull the unwanted teeth away from the tape. When the required length is correct, replace the metal stops and pinch them firmly in place. 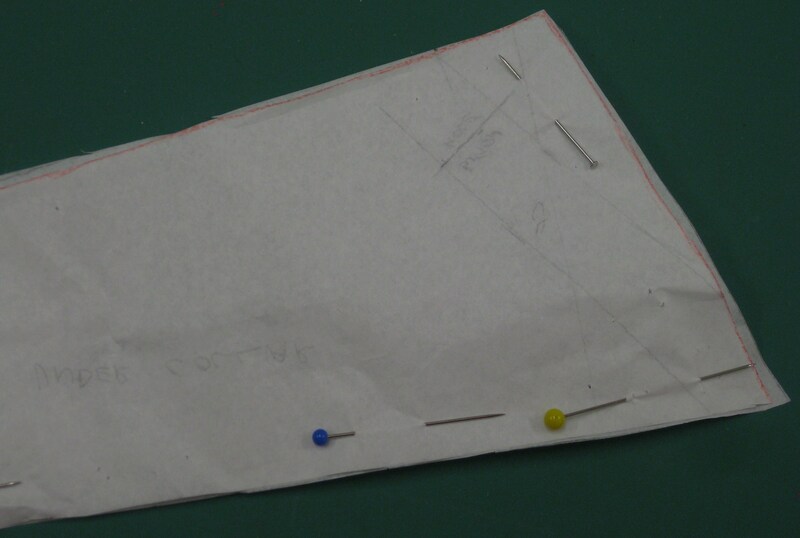 Make a template to assist with final topstitching of the zipper. 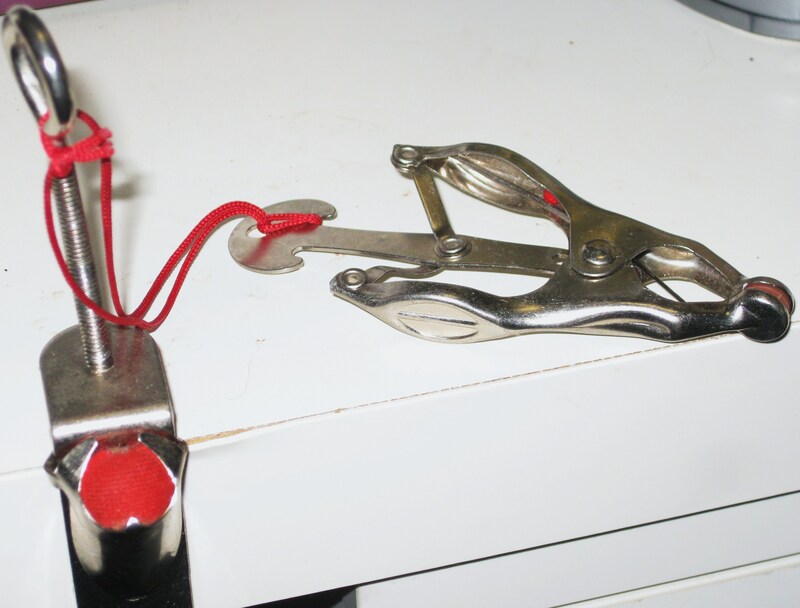 Zipper template is useful to accurately mark topstitching position. Sew approximately 2”/5cm of crotch seam first – be sure to end exactly at the dot which marks the beginning of the zipper opening and back stitch to secure. 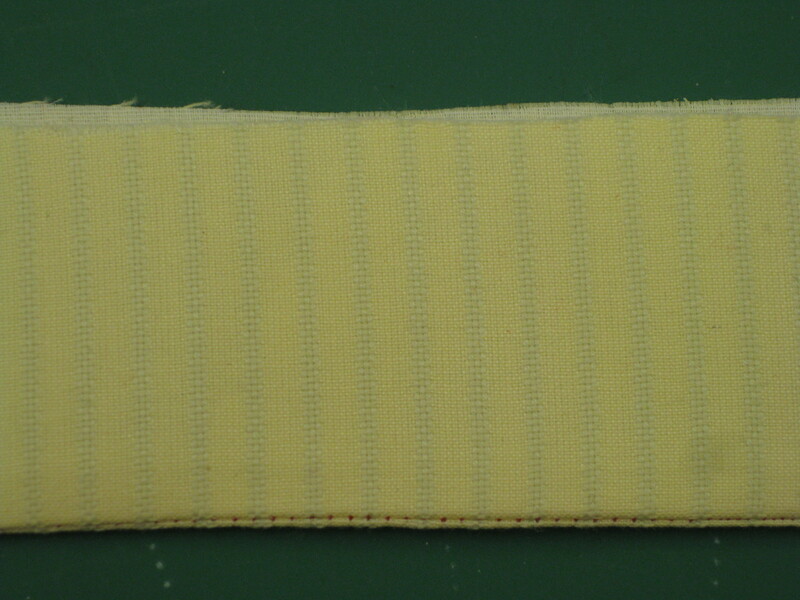 Stitch approximately 5cm (2″) of crotch seam, finishing at mark indicating bottom of the zipper – back stitch to secure. 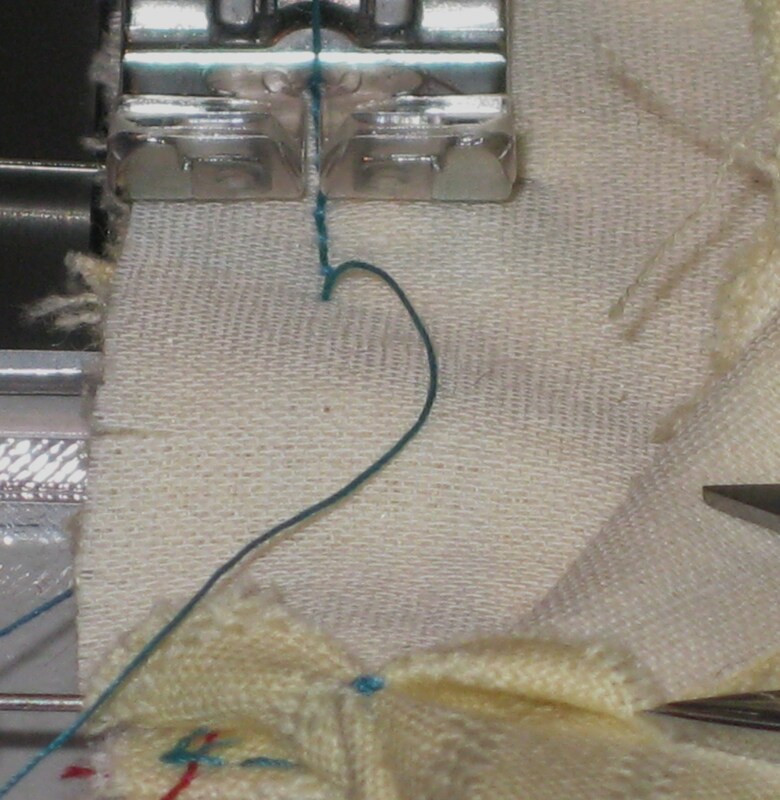 Lengthen stitch to 4.0 and machine baste the remainder of CF seam. 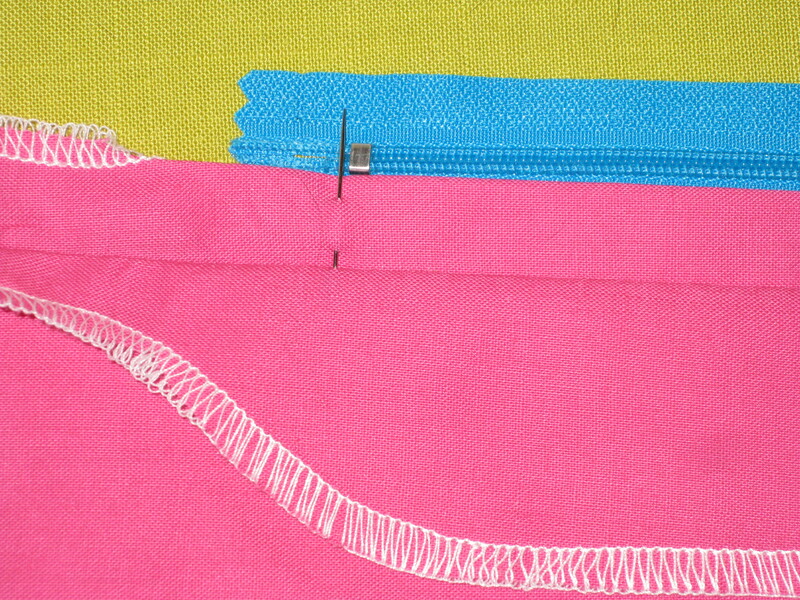 Machine baste centre fronts together (SL4.0-5.0) in the area of the zipper opening; press seam flat and then open. 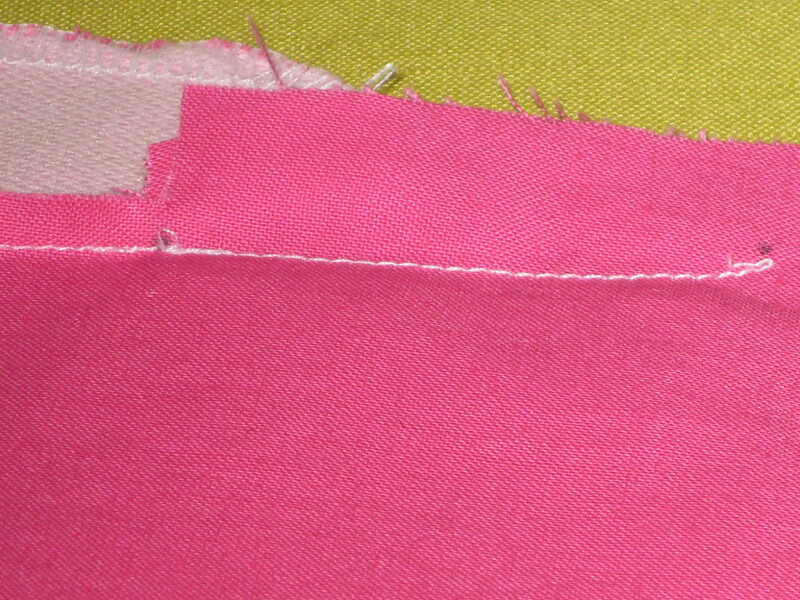 Then press a fold on the underside seam allowance so the fold is flush with the cut edge of the fabric. Open the zipper and position the teeth of the zipper along this fold with the zipper stop at the bottom of the opening. 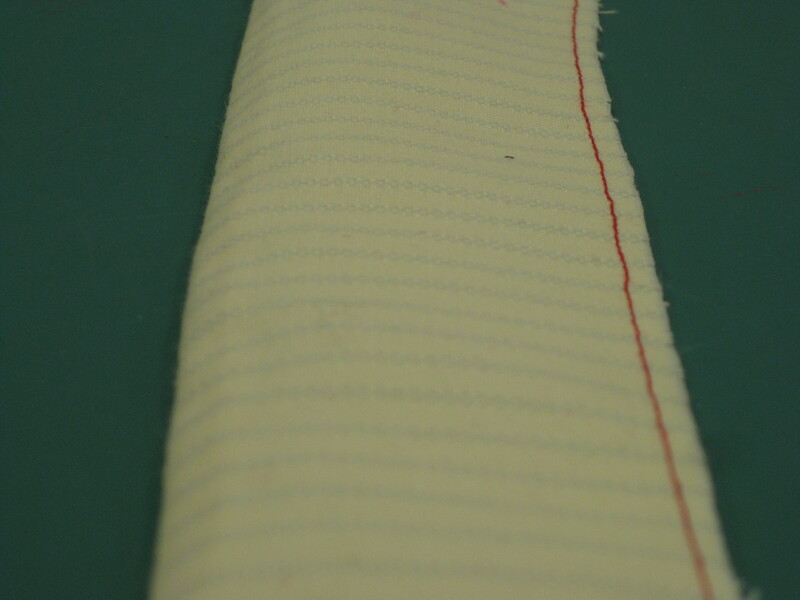 Position zip (coils up) under the folded back seam allowance – align the stop to the marked position. 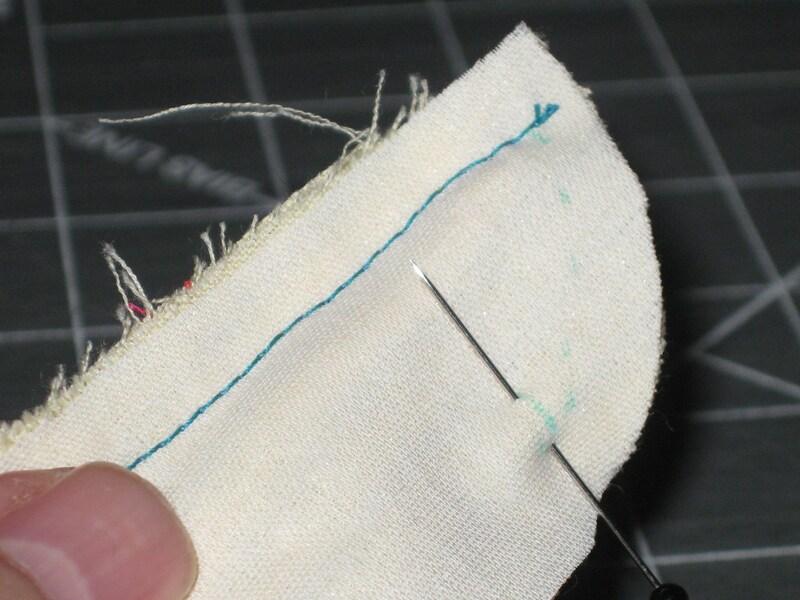 Using a zipper foot, edge stitch the zipper tape in place. 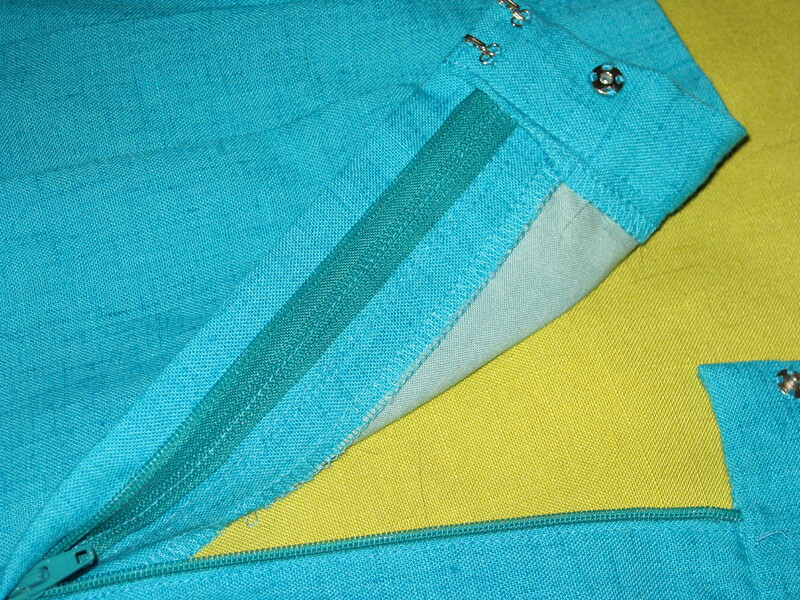 Using zipper foot, stitch on the seam allowance close to the zipper teeth and along the length of the zipper. Close the zipper and place the garment right side down on a flat surface. Allow the zipper to sit flat against the garment (right side down) and pin the other side of the tape to the cut on facing. 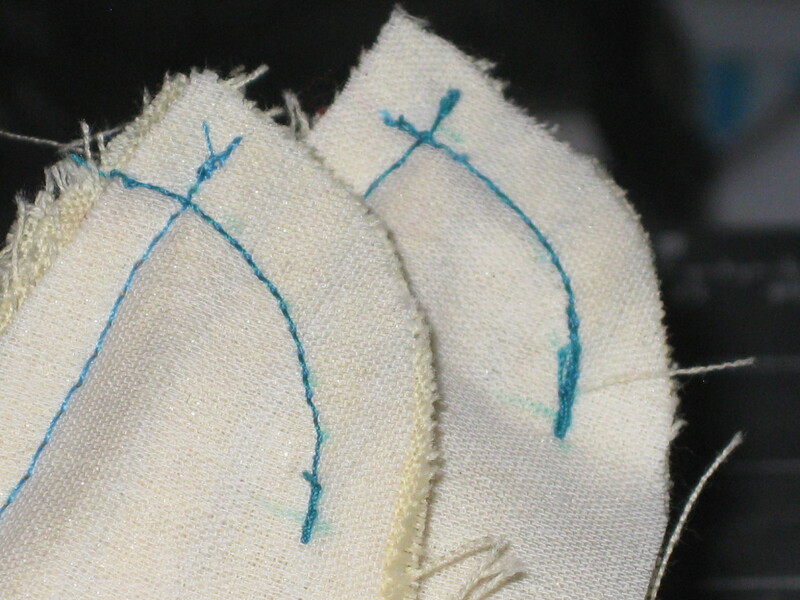 Stitch in place with the regular sewing foot. 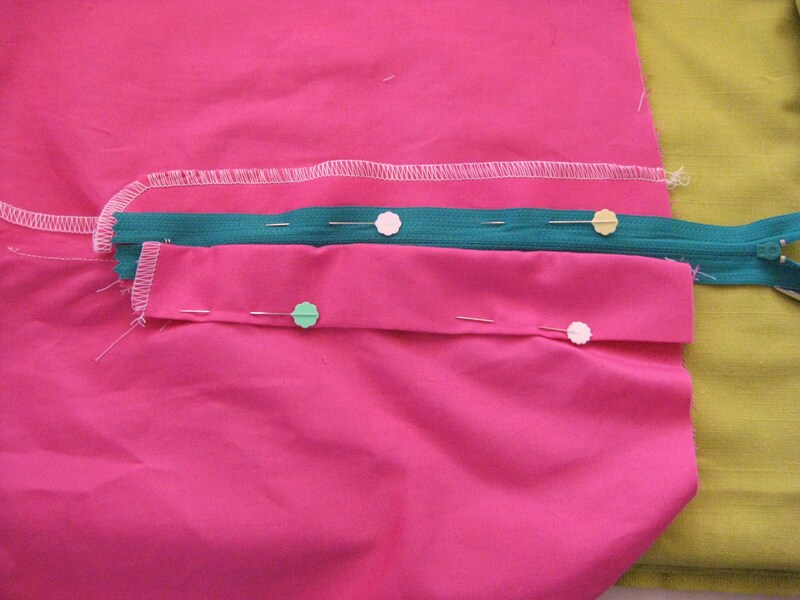 Lay the work flat with wrong side of zipper uppermost. Pin and stitch the other side of the zipper tape to the opposite seam allowance. 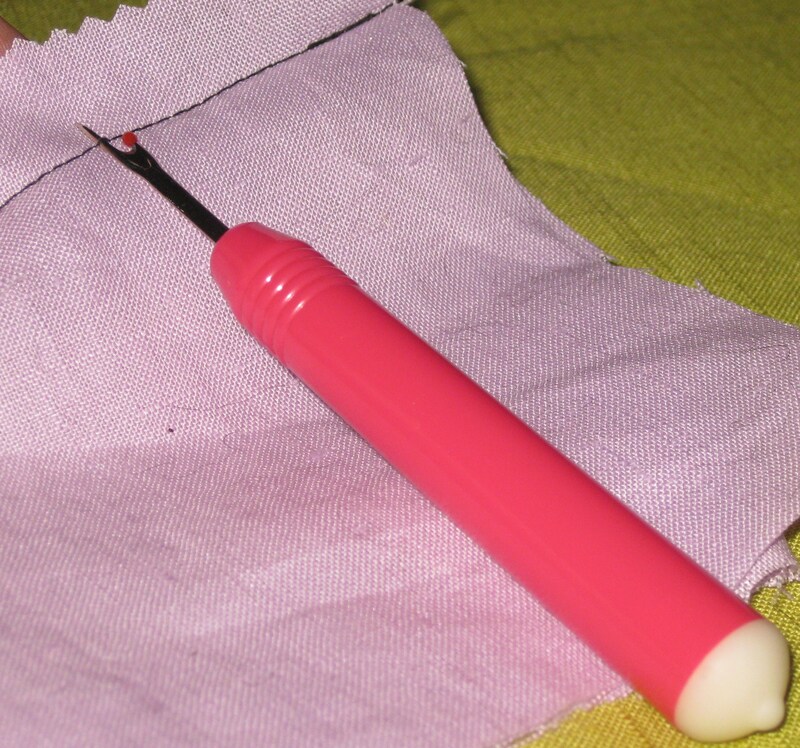 Using a sliver of white soap or chalk marker and your template, mark stitching line on right hand side of front and topstitch from bottom of zip to top – bed the needle into the centre front seam line and walk the needle until past the metal stopper. Turn work right side up and use template to chalk mark stitching line on front of garment. 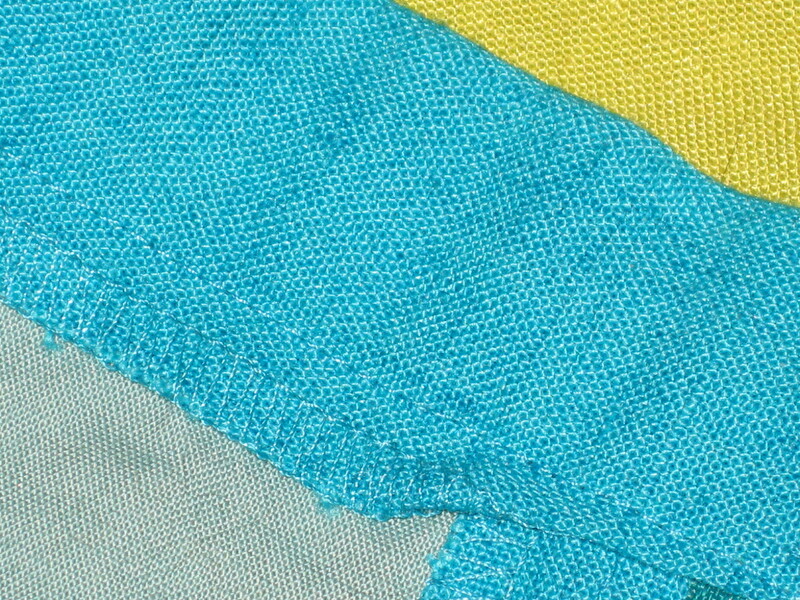 Stitch bar tack at bottom edge of zipper opening – bar tack is stitched with regular zigzag SW2.0, SL0.5 for about 1cm and centred over the zipper stitching. 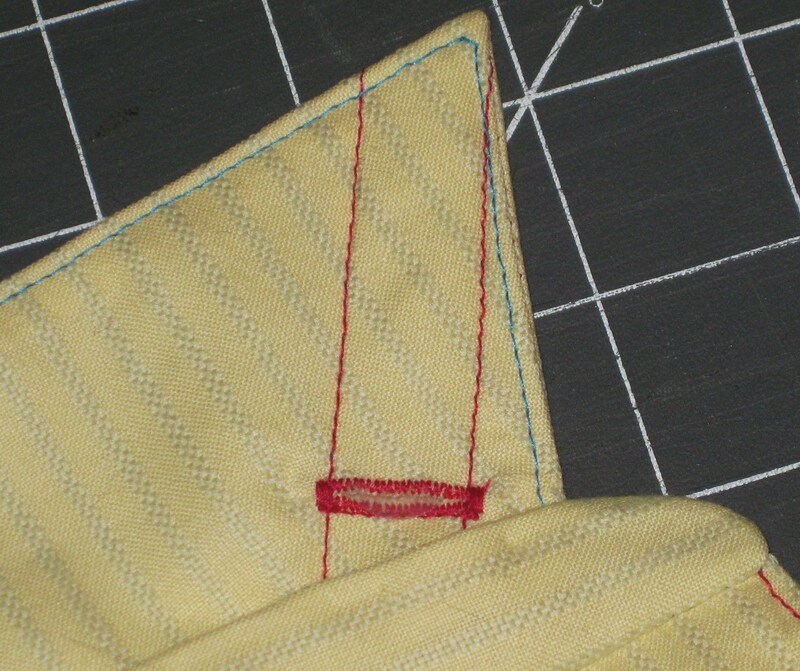 Use a small zigzag to make a small bartack at CF at the base of the topstitching. Finished zipper installation with zipper hidden. Press under 1cm/ ½” on the underside seam allowance. 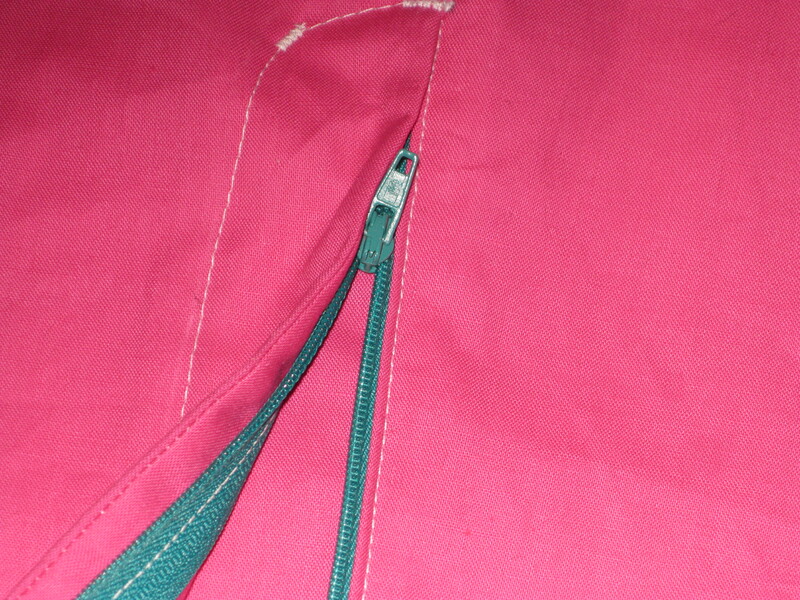 Press under 1cm(1/2″) seam allowance above point where bottom of zipper will sit. Make the fly protector by folding wrong sides together and overlocking the edges to close. 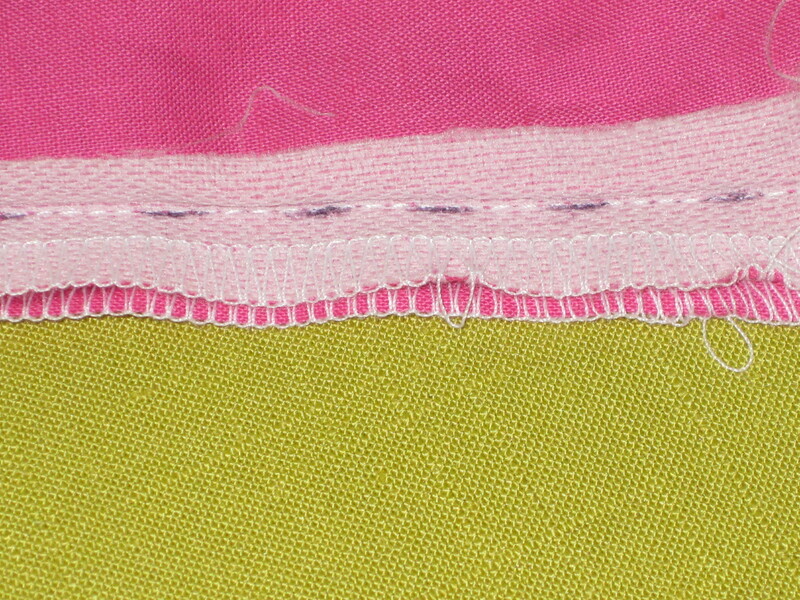 Stitch fly to centre front seam – working from bottom up – press seam flat, trim back by half and press seam open. 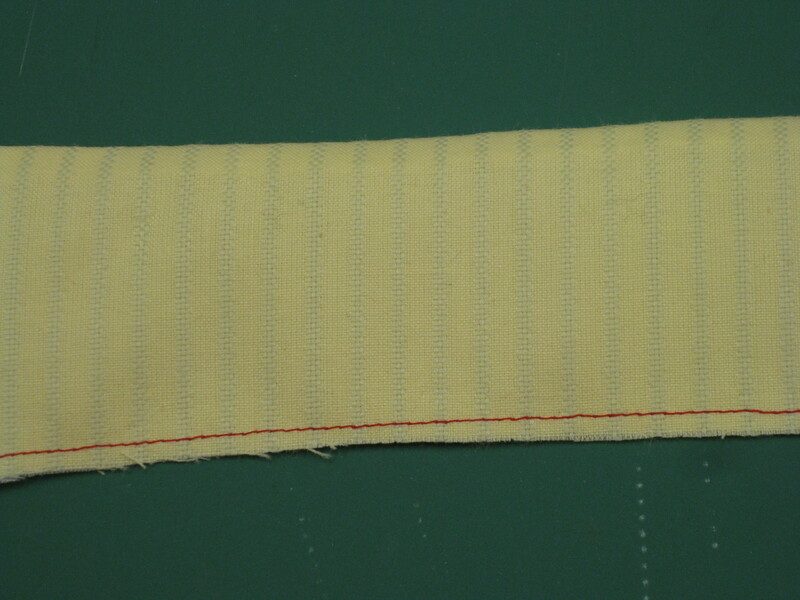 Fly stitched along CF seam – stop at mark indicating bottom of zipper. Fold fly to wrong side and edgestitch if desired. 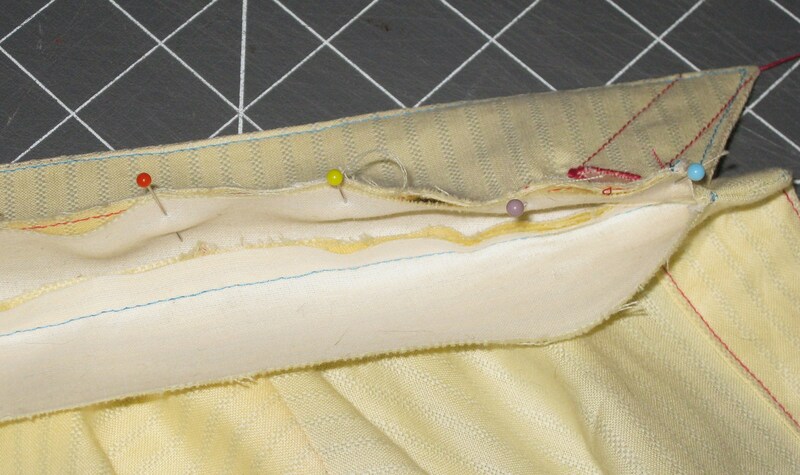 Press fly to wrong side and understitch above marked point for bottom of zipper. Starting exactly at the dot which marks the beginning of the zipper opening sew approximately 5cm of crotch seam and back stitch to secure. 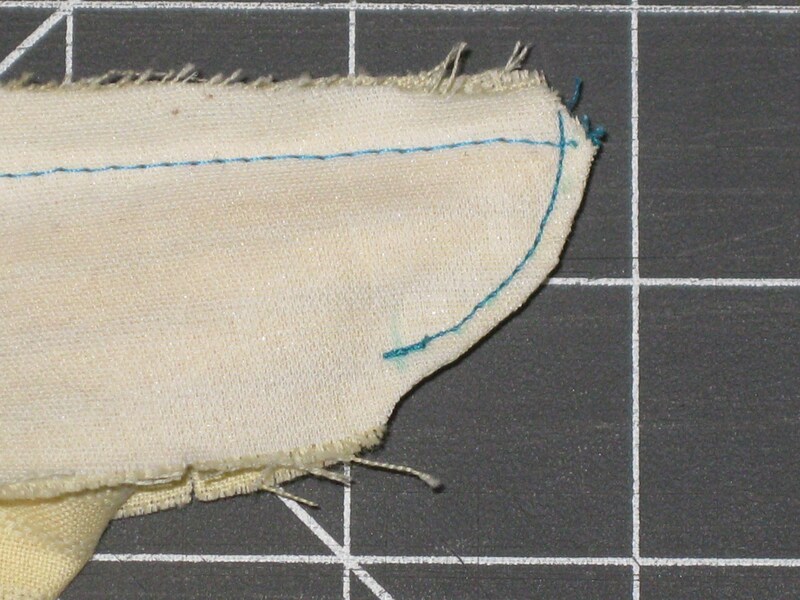 Stitch approximately 5cm(2″) of crotch seam – start exactly at bottom of fly seam. 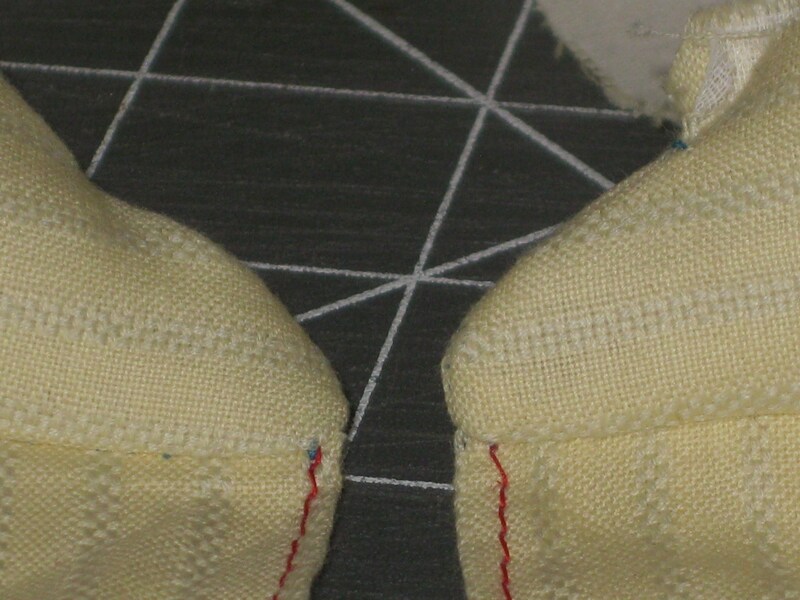 Working with zipper teeth closed, place zipper tape under the fold and fly protector underneath – using zipper foot stitch close to the zipper teeth from bottom to top through all layers. 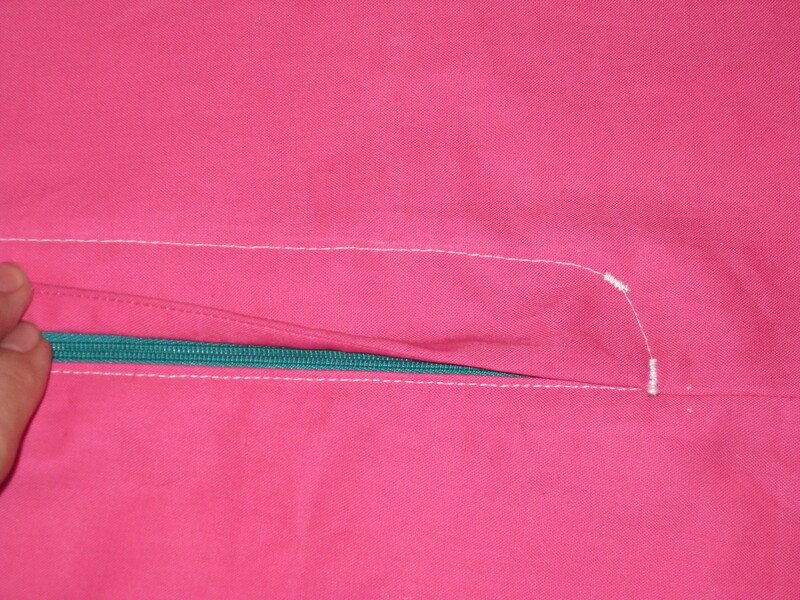 Place right side of zipper against underlap fold – keep teeth close to zipper. Stitch in place from right side. Place garment on flat surface, wrong side up and fold the zipper shield out of the way. 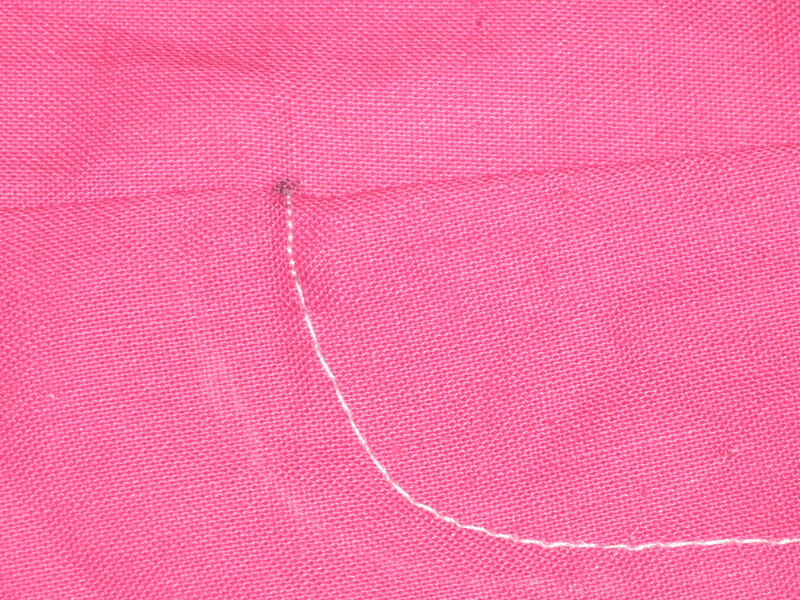 Pin other side of the zip to the right hand side fly facing and stitch in place. Position edge of fly with CF together over underlap. Pin underlap out of the way. Stitch other side of zipper to fly facing. Using a sliver of plain soap or chalk marker, mark stitching line on right hand side of front. 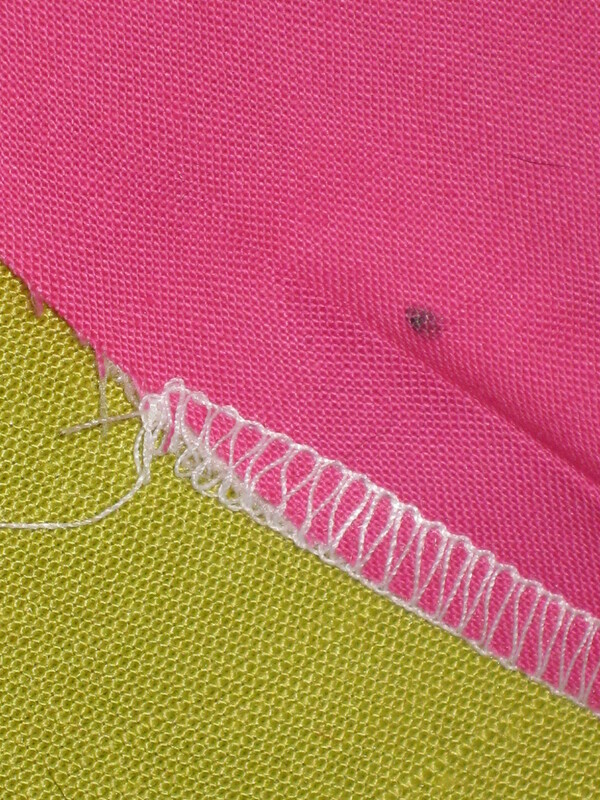 Start fly stitching with small stitches (1.5) to add extra security. 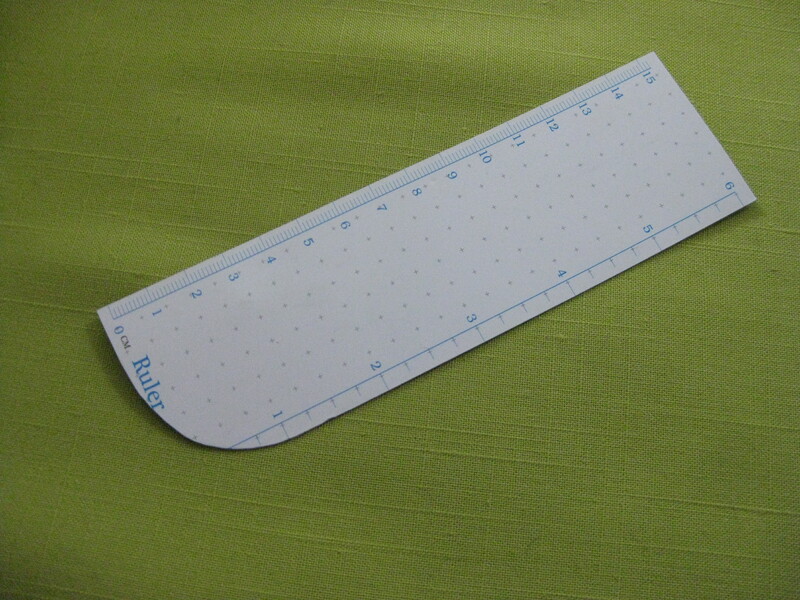 Chalk marks can be easily removed using a clean eraser. Position the zipper shield in place. 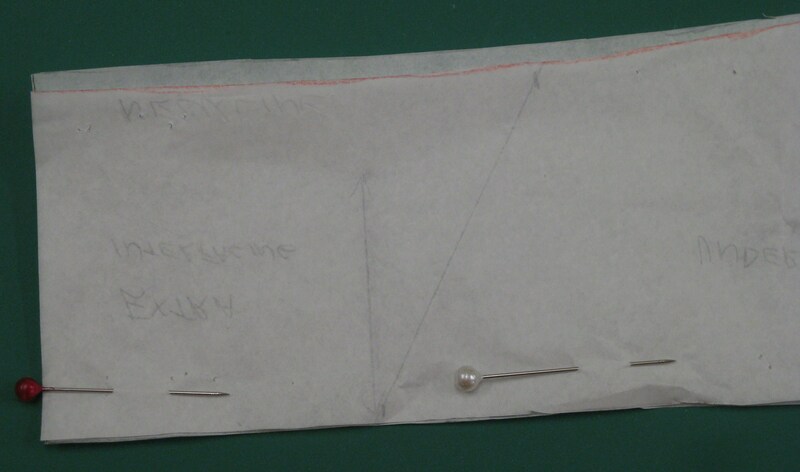 Topstitch from bottom of zip to top through all layers – a cardboard template can be used to mark the stitching line. 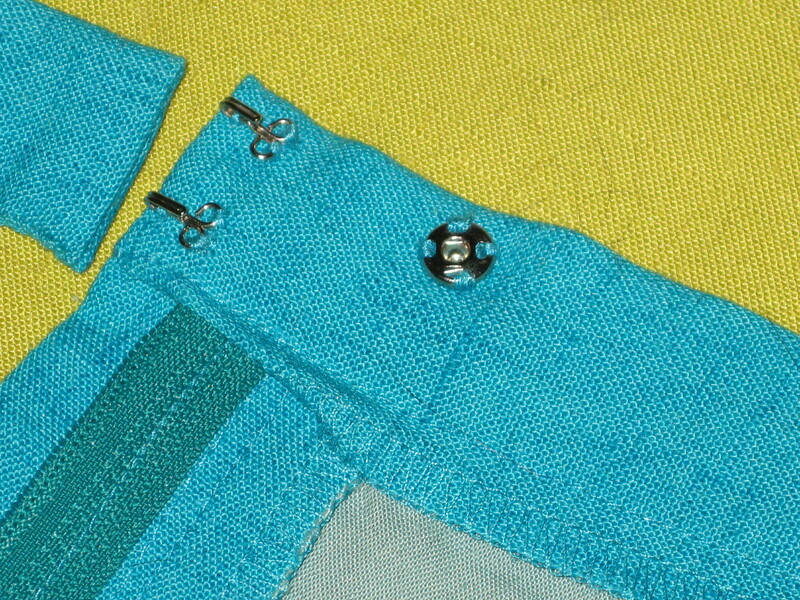 Stitch bar tack at bottom edge of zipper opening– bar tack is stitched with regular zigzag (SW2.0, SL0.5) for about 1cm and centred over the zipper stitching. 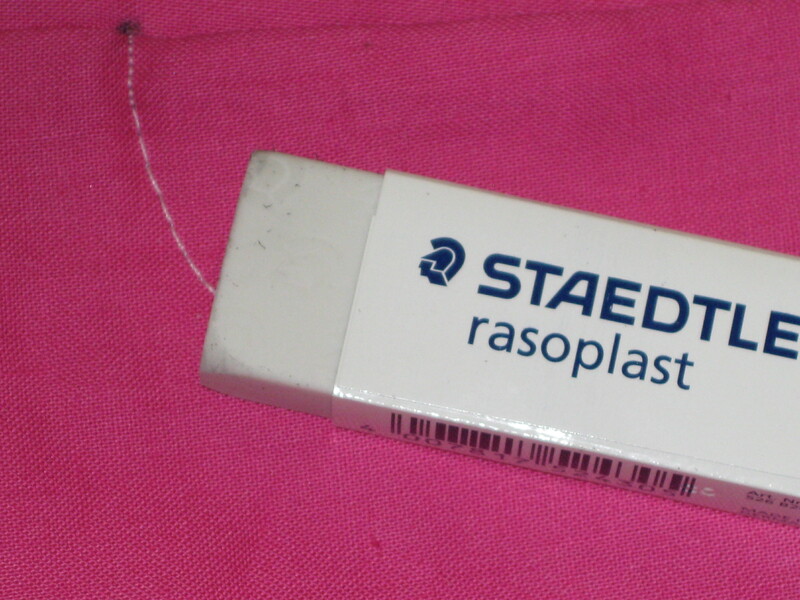 Add an additional bartack to ensure zipper shield stays in place. 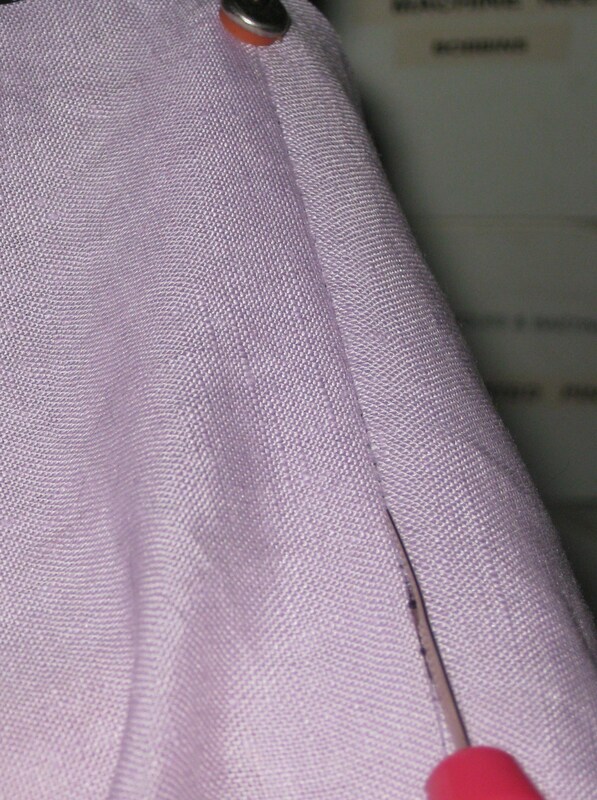 With fly facing in place underneath, stitch bar tack at bottom of zipper at CF and on curve of topstitching – to catch fly facing and keep in in place. Underside showing secured fly facing. 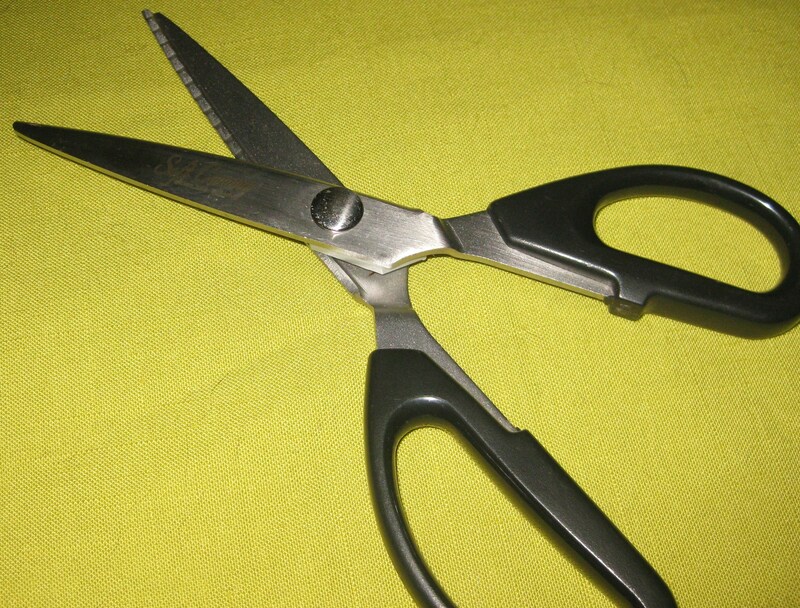 With a cut on fly, the waistband will extend from the centre front on the fly side to the edge of 3cm/1 ½” beyond the zipper teeth on the underside. With a traditional fly, the waistband will extend on the left hand side so that it finishes flush with the zipper fly extension. 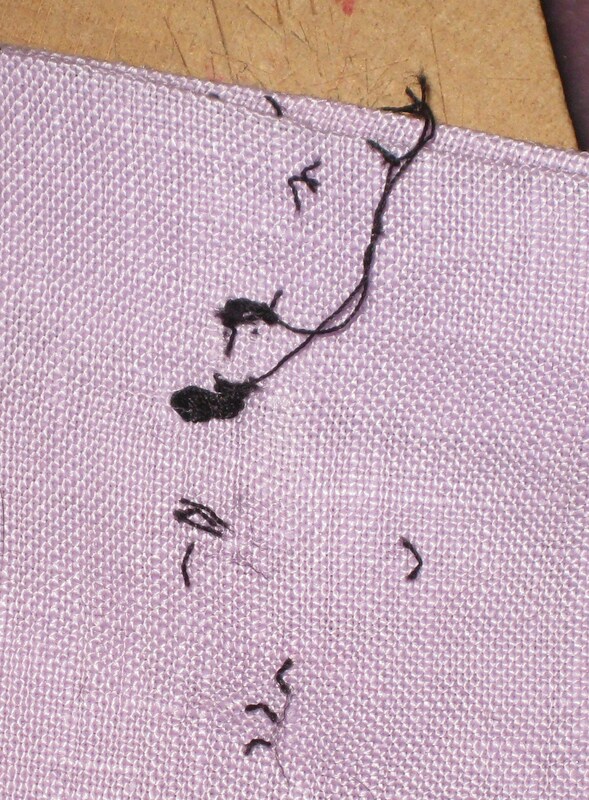 Pin in place and stitch using your desired method. I usually either press under one side of the waistband or overlock/bind one long edge and stitch the garment side in place with the band on top so the action of the feed dogs will ease the waist of the garment to the band. Fold the waistband wrong sides together. 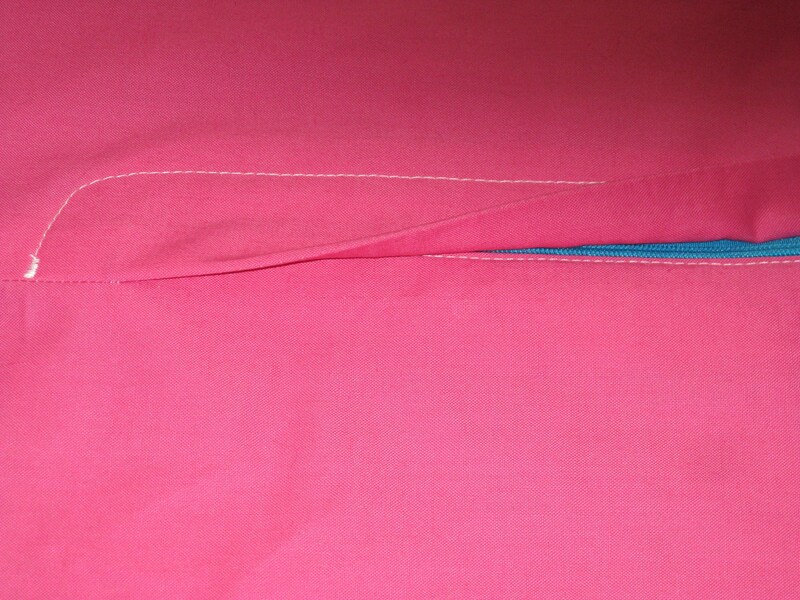 On either end stitch from the waist seam line towards the fold – do not stitch over folded fabric. 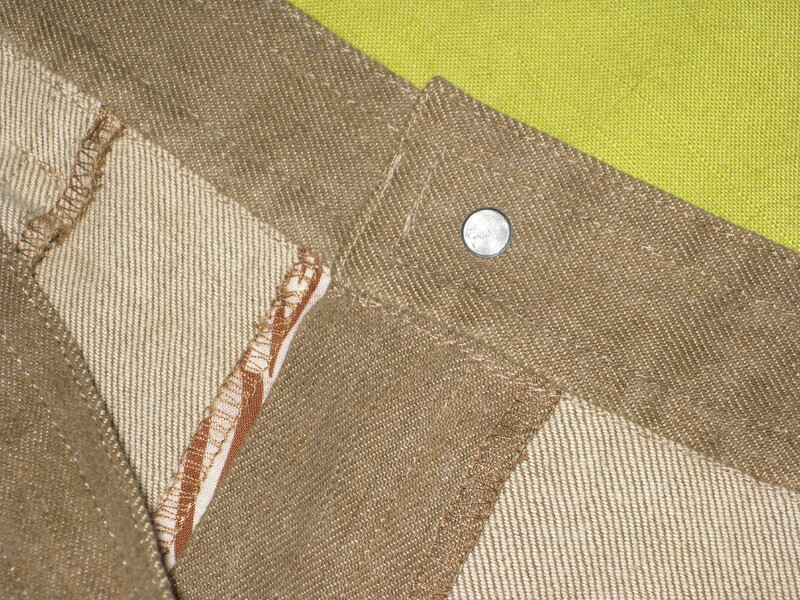 There is no need to clip across the corner of this seam unless you have a waistband with a seam on both sides. 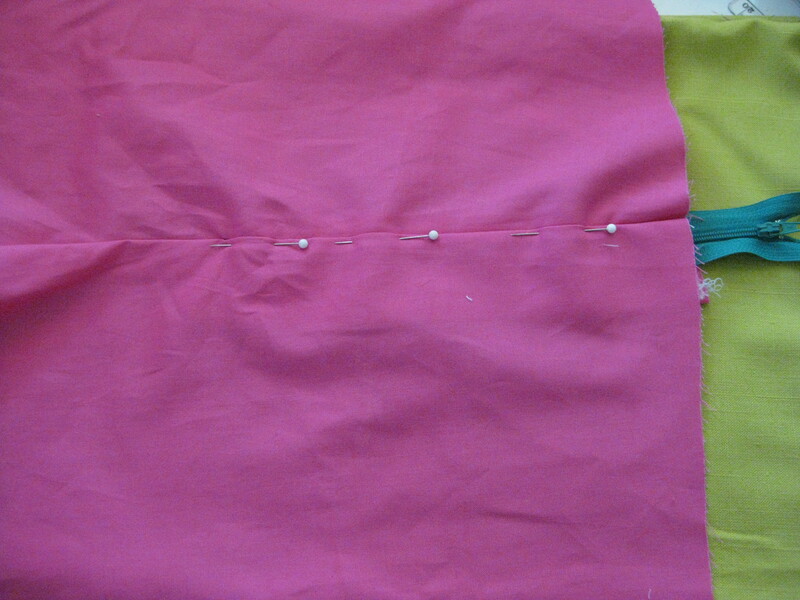 Turn to right side, pin waistband in place and baste before stitching in the ditch or topstitching from the right side. I hope you have found this blog helpful and would love to hear your feedback. Next time I will cover exposed and separating zips. by David Page Coffin Published The Taunton Press, Inc. 1998. A variation of the method has also been featured a number of times in Australian Dressmaking with Stitches. Collar on stand with neckline worn open. Previously I had used the methods shown in the pattern guidelines, often with disappointing results – I could never seem to get the rounded ends of the collar stand exactly the same on both sides without lots of unpicking and resewing. This method works very well with lightweight shirting fabrics and I have also used it on heavier jacket weight fabrics with good results. Would you like a crisp or softer collar? Will the collar band be worn mostly open or closed? Do you want to wear the collar standing up at the back? Is the fabric opaque or sheer/semi-sheer? Does the fabric print need to be highlighted by using contrast details? Working with smaller seam allowances makes the attachment of the collar stand and collar a lot easier to handle. I normally use a seam allowance of 6mm to 1cm / ¼”- ½”. After removing any excess seam allowance width from the collar, collar stand and neckline seams, I cut out the upper and under collar and collar stand pieces. So that the upper collar will roll out of the stand without showing any of the under collar, it is important that the upper and under collar are separate and different pattern pieces. I have read many times that approximately 3mm / 1/8″ should be removed from the neck edge and ends of the under collar. This can cause problems if the ends of the collar do not meet exactly where they are joined to the stand. 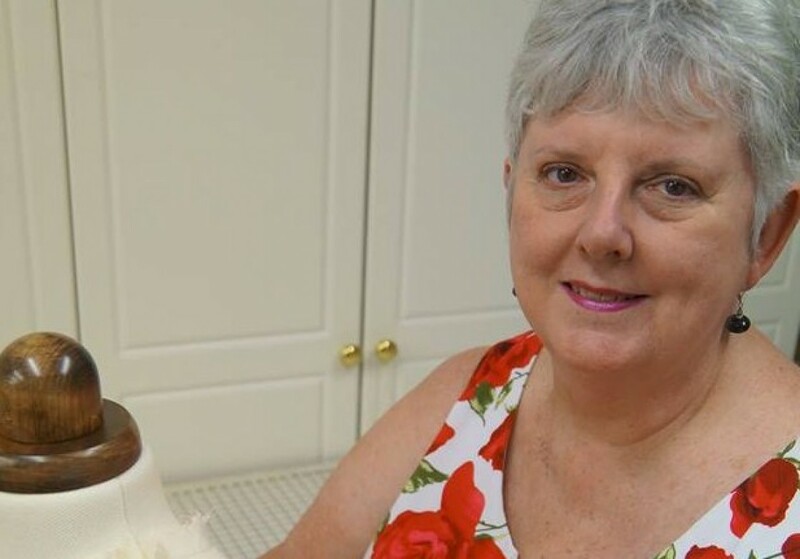 The pattern I have used is a KwikSew shirt pattern which uses 6mm/1/4″ seam allowances and provides separate pieces for the upper and under collar. It is interesting to compare the two and see exactly where to remove the excess from a pattern that is the same for upper and under collar. The corner edges of the collar which will be joined to the stand are not trimmed. Under collar pattern has been placed on top of upper collar, matching CB position. Front edges of collar remain in the same position on both pieces. Narrow wedge trimmed from front edge. 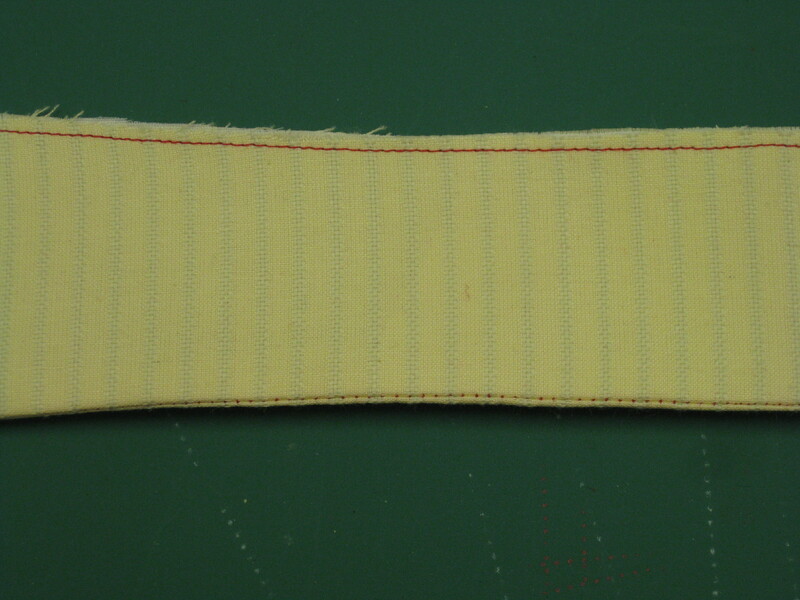 Under collar is approximately 3mm/1/8″ narrower in CB and tapers towards front edge at neckline. The collar and stand pieces can be cut on either lengthwise or crosswise grain to use the fabric pattern to best effect. They can also be cut using bias grain with the addition of a centre back seam – the interfacing can be cut on a more stable grain to keep the pieces in shape during the life of the garment. Fuse the interfacing to each collar piece and both of the stands. I prefer to use a woven fusible lawn which is lightweight but can be layered if extra stiffness or support is needed. After fusing, reposition pattern piece and trim accurately. Fabric can stretch or distort during the fusing process. Tip: Always test interfacing on a large scrap of fashion fabric to test stiffness and reaction of adhesive to the chosen fabric. 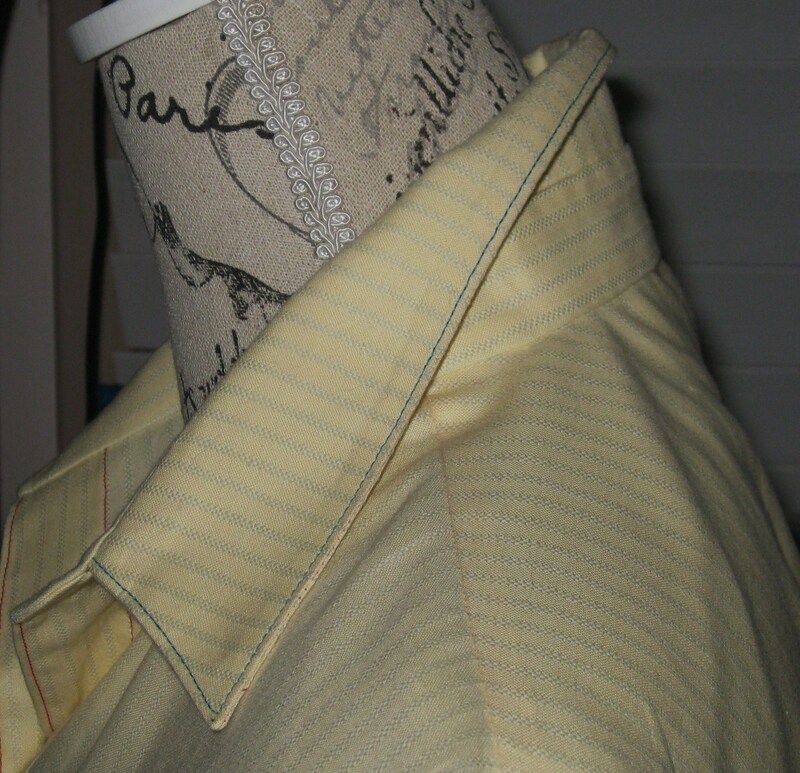 Tip: To make a shirt collar stand up at the back, use extra interfacing in the back of the collar. Cut and fuse an extra layer of interfacing to do this. This piece of interfacing should be narrower at the outer edge of the collar then at the neck edge. Additional interfacing to support collar if it is to be worn up. Draw position marks on pattern. Cut interfacing and fuse to under collar on top of original interfacing. 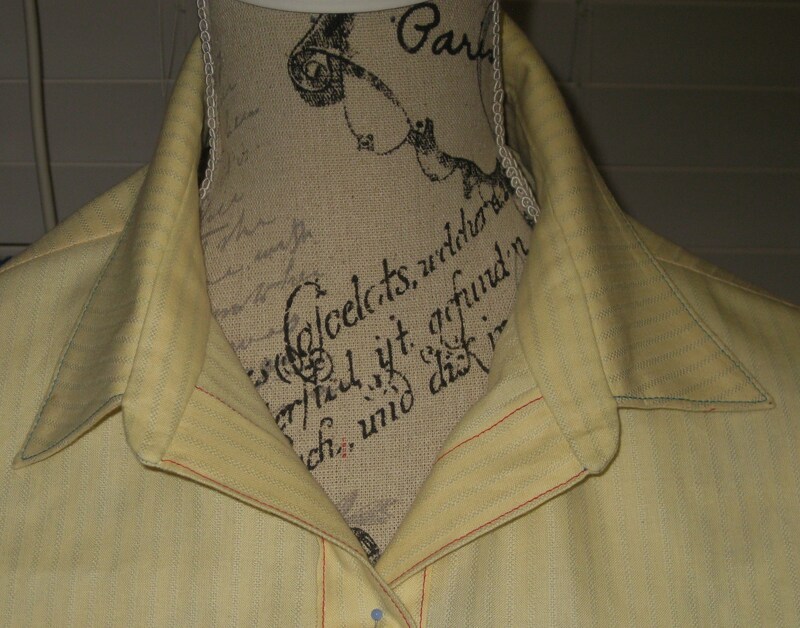 Transfer all pattern markings to the wrong side of the collar, stand and shirt neck. For further accuracy lightly mark the collar attachment points, the curve of the seam at the ends of the collar stand and the seam allowances. Tip: Make a cardboard or plastic template for the curved at the edges of the stand to ensure that they will be the same shape. If your fabric is very soft, collar stays can be helpful in keeping the collar points sharp. Mark the position and width of the stays on the pattern for the under collar. 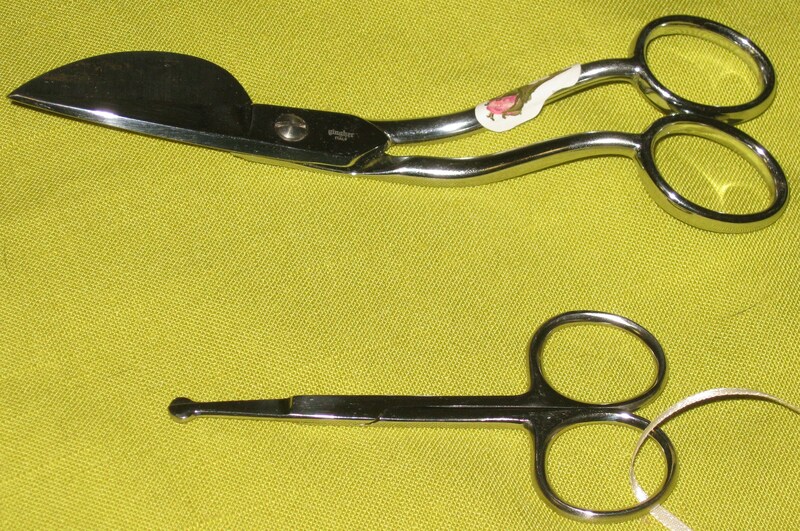 Also mark the position of a buttonhole to allow insertion of the stay. 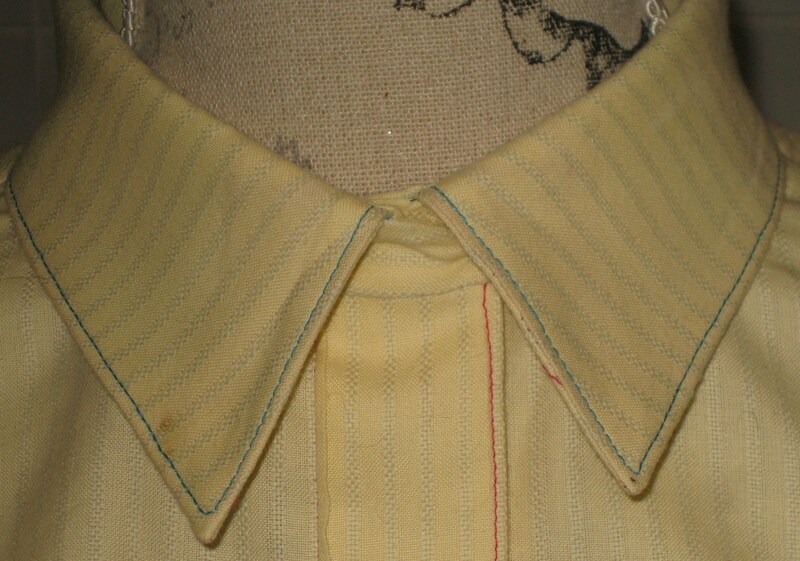 Mark position of collar stay and buttonhole on pattern and transfer stitching lines to right side of interfaced under collar. Stitch the buttonhole on right side of under collar and cut. Place a piece of scrap fabric against the wrong side of the under collar and stitch the pocket for the stay. Collar stay pocket on under collar. 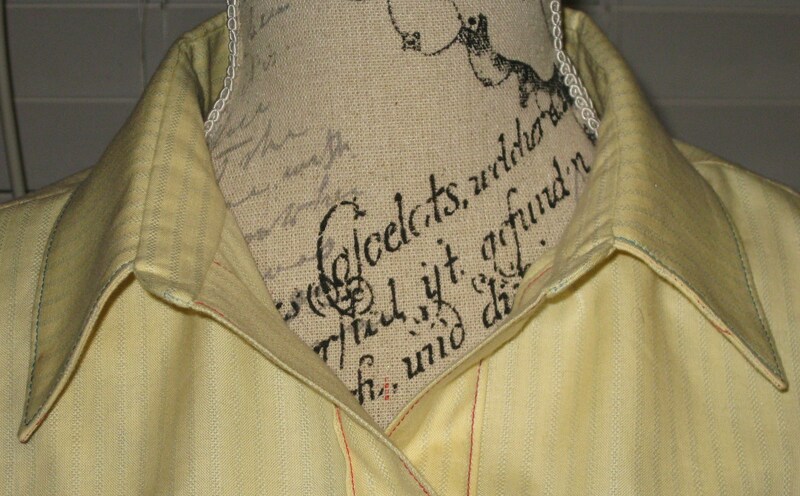 The collar is then constructed as detailed below. 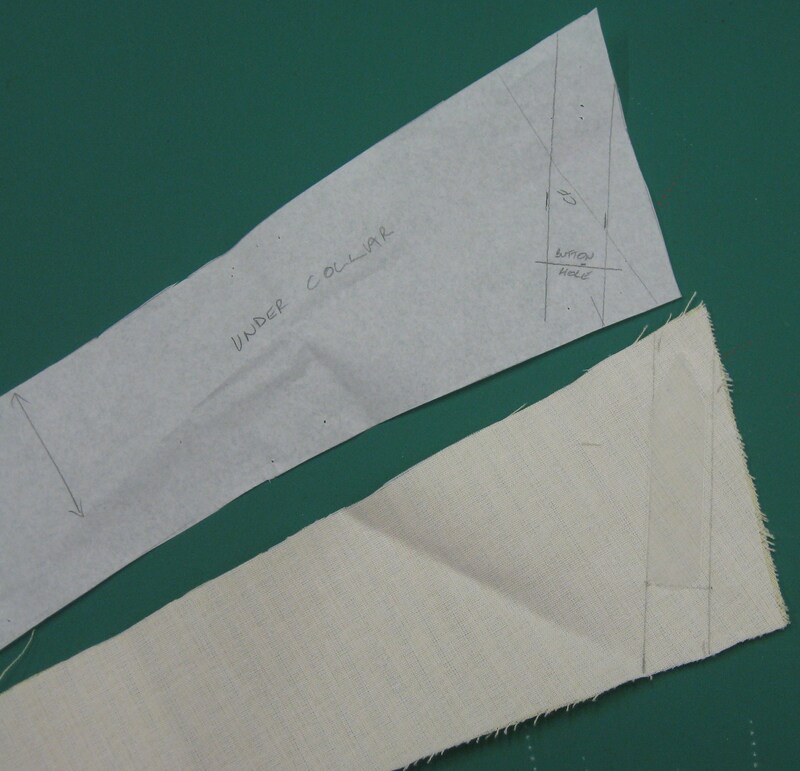 Construct the collar, stitching from centre to each collar end and press (seams open first) with the upper side down. Edge stitch the outer edge of the collar if desired. Carefully roll and mould it around a tailor’s ham. Pin the collar to the ham, steam and set aside to cool. See blog post 5th July, 2015 “Collars – Tips and Techniques”. Before collar is inserted into the stand, stitch the neck edges together within the seam allowance. Collar pressed in place and, with under collar uppermost, a small strip of upper collar is visible. To maintain correct placement when collar is attached to stand, place two bottom edges exactly together and stitch within seam allowance. When collar is placed on a flat surface, the roll of the upper collar becomes obvious. Side view with upper collar on top. Sandwich the shirt neck between both collar stand pieces – the collar stand pieces will be right sides together. Pin along neck edge through all layers and stitch along the neck edge from end to the other. If using a double yoke, tack both pieces together at neckline (on the garment side so tacking will not be caught in stitching). This will keep neckline edges together and minimise problems when attaching the stand. Neckline edge sandwiched between the collar stand pieces and pinned in place. 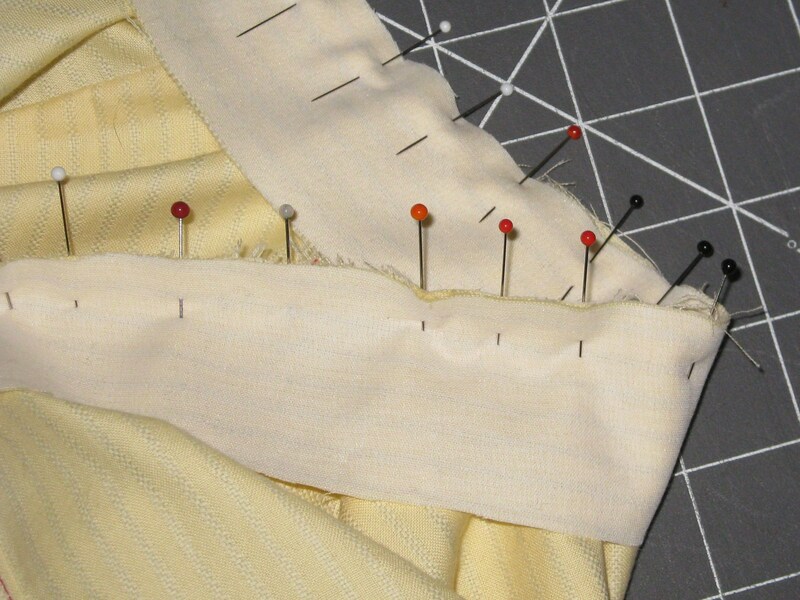 Pinning at right angles to the seam keeps everything in place well when stitching curves. Tip: Use your left hand to smooth the shirt fabric under the collar stand as it comes up to the needle – be sure not to pull the fabric – the cut edges must all remain together. When stitching, keep fingers under stand and smooth fabric at right angles to seam line as you proceed around the neckline curve. Mark the centre front on both ends of stand. Both ends of stand have CF and stitching lines marked. Tightly roll the shirt front out of the way. Roll the shirt tab edge tightly between the stand pieces. 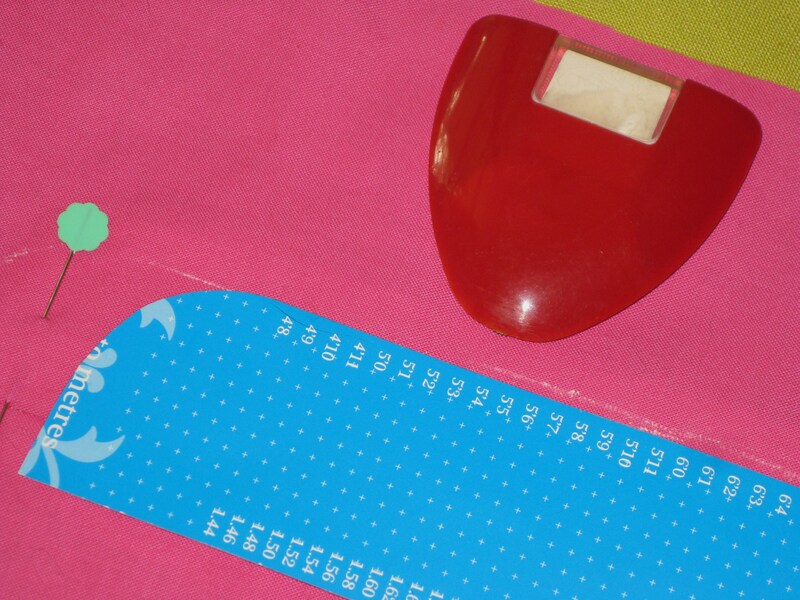 Pin the rounded edges together – place a pin right beside the tab at the front edge of the bodice to guide the position of the machine needle. It is important not to stitch through the tab. Wrap stand pieces over the rolled section and pin together at CF. 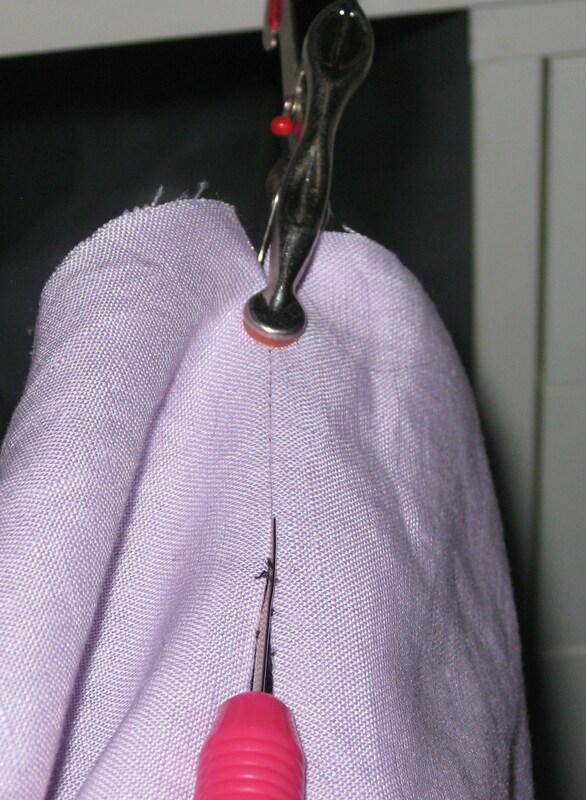 Fold back upper seam allowance and position a pin so that it lies right against, but not through, tap. 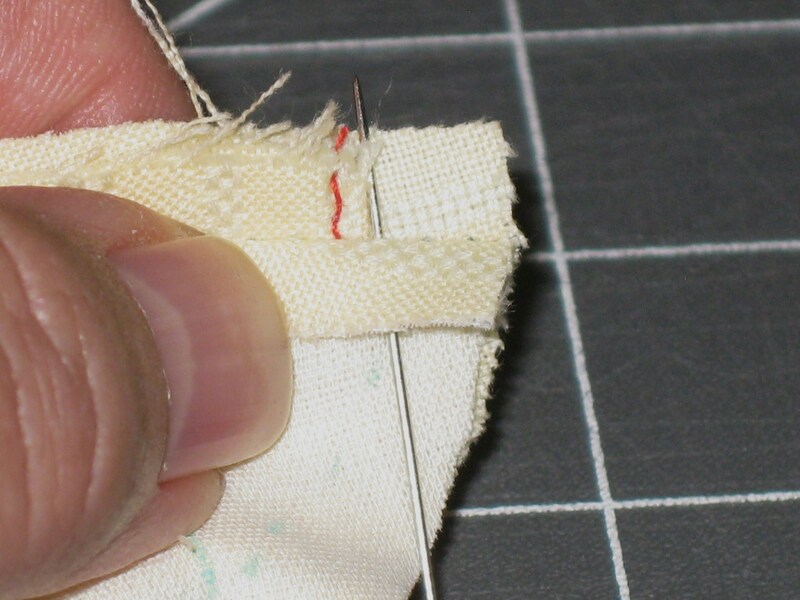 This pin will help with positioning the machine needle to commence stitching. 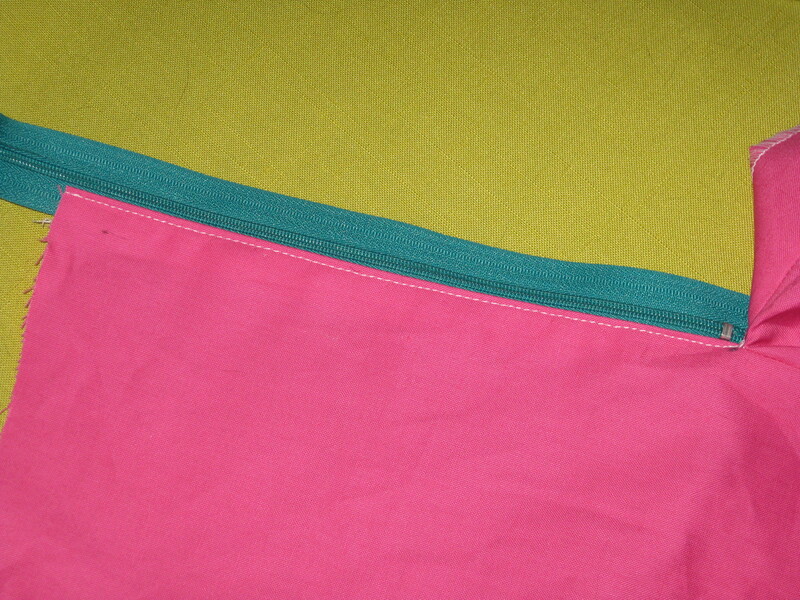 Both ends stitched from neckline to CF. Check the curves match. 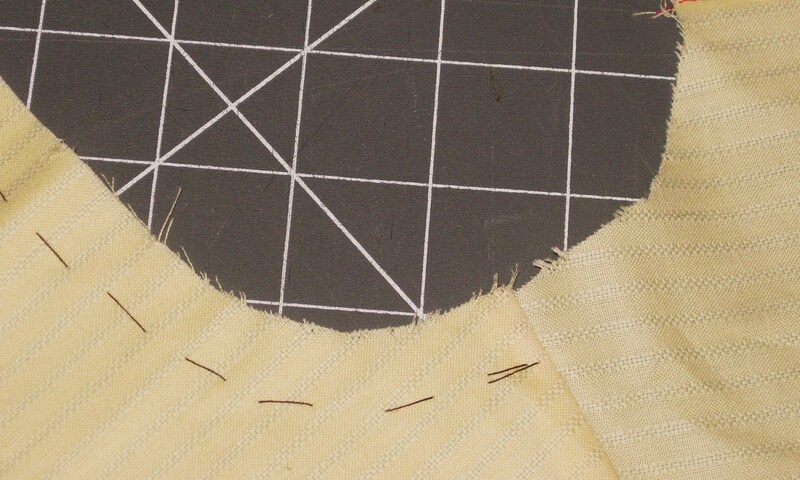 Using small stitches, sew around the marked curve to the collar attachment point. Repeat at the other end. Grade the inside neck stand turnings to collar attachment point. Trim to 3mm (1/8”); clip the curves as needed and trim across the corners. 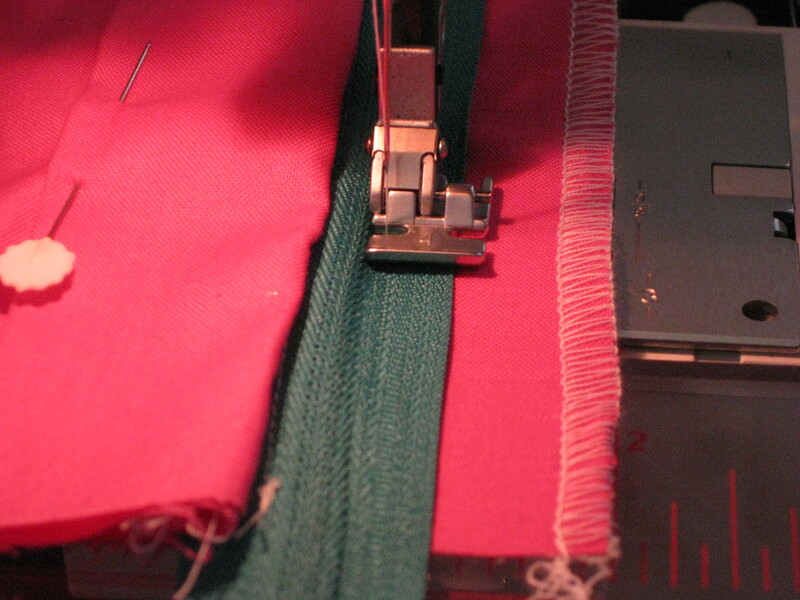 Trim the folded or pieced tab section between the stand seam allowances; clip across turn from neckline into stand. 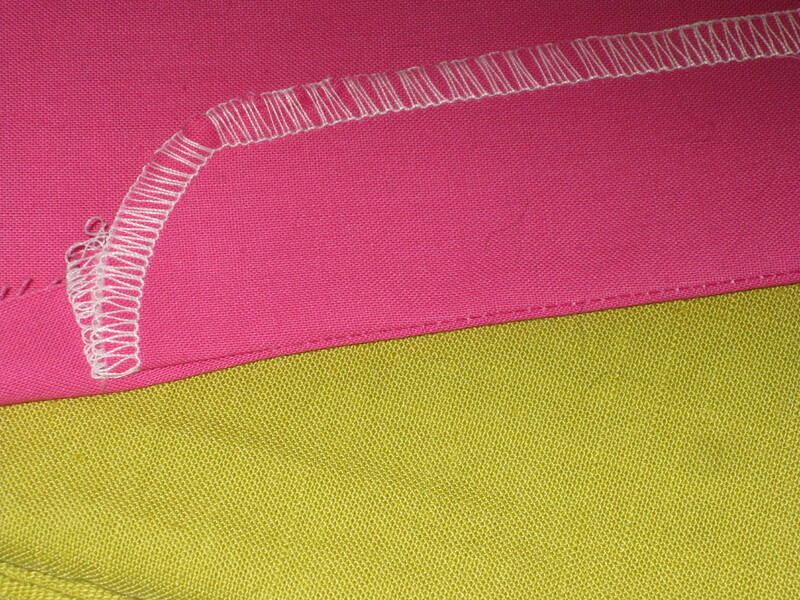 Clip the curved section quite close to stitching – this section may also be notched on thicker fabric. Do not clip the top of the band to CF as this can cause stress of that point when collar is attached. Tip: Do not clip to the end of the stitching. Turn the work right side out and press, taking care not to stretch the unfinished edge of the stand. Lay the shirt on a flat surface, with back closest. Place the collar as it will ultimately sit, with upper collar on top and against the collar stand. Flip the collar towards the inside section of the stand and pin the upper collar to the inside neck of collar stand. Match the centre back, shoulders and front edge with the collar attachment points. Pin to the inside of the stand, leaving the outside stand free. Shirt RS up on flat surface and collar in place as it will be worn. Collar flipped to inside neck edge and pinned with upper collar to inside of collar stand. 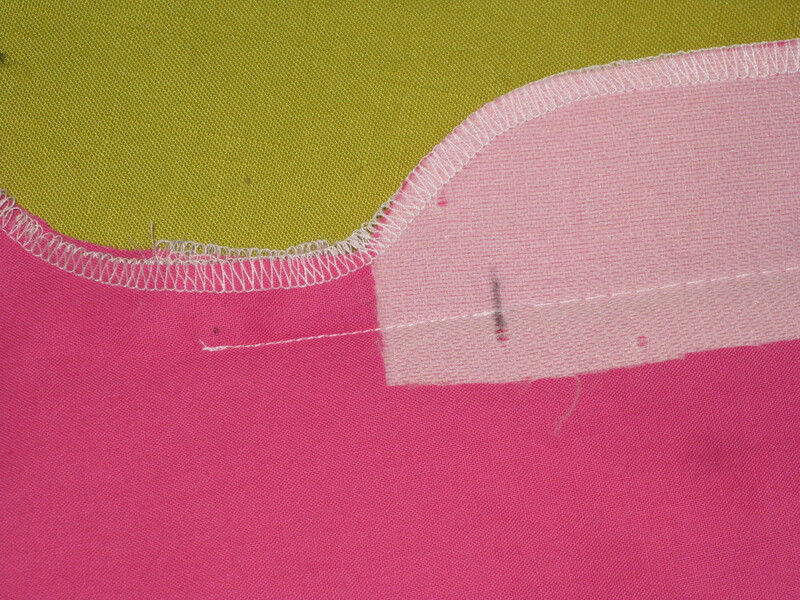 Machine stitch through all pinned layers, commencing and finishing exactly on the marked points. Tip: To avoid stretching the collar stand, I find it helpful to start stitching approximately 25mm /1” from the end of the collar to the opposite end. I then reverse the work and stitch back to the original end. Overlap the stitches rather than backstitching. 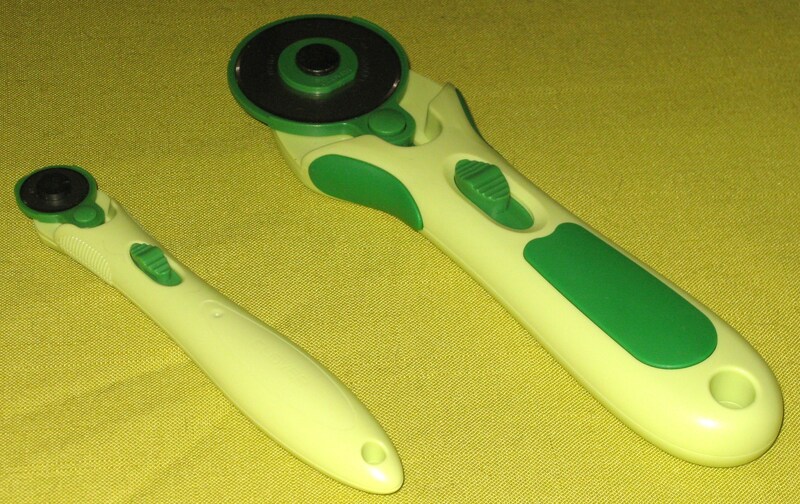 Start stitching with collar stand on top and approximately 3-4cm/1 1/2″ from edge. 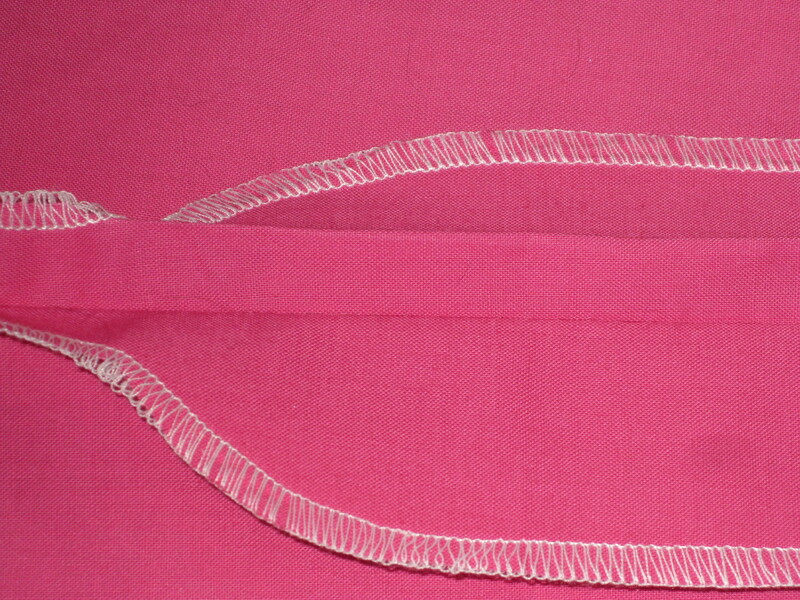 Stitch to opposite end of collar. 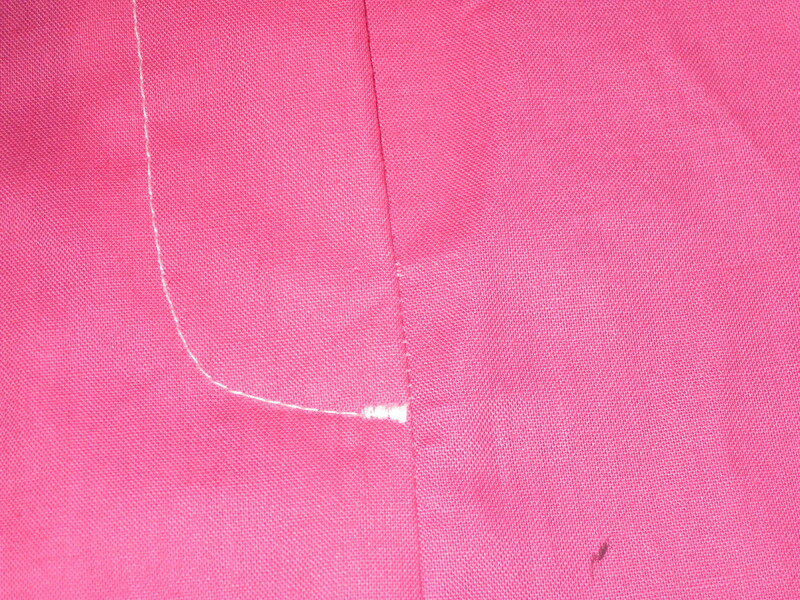 Turn work and stitch the remainder of seam towards the other end of the collar. This avoids the possibility of stretching the end of the stand when positioning the machine foot. 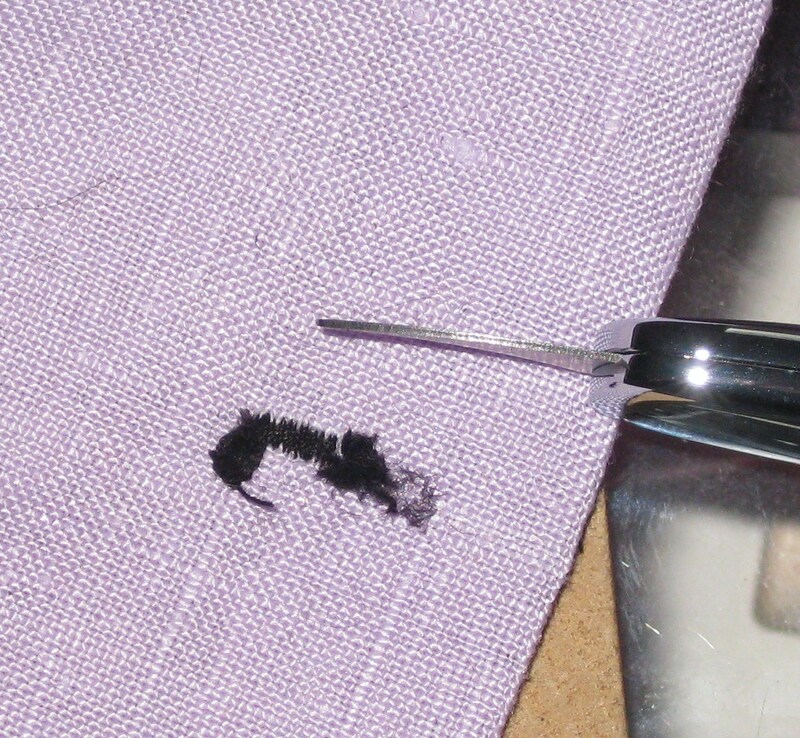 Turn under the edge of outside collar stand 6mm (1/4”) and carefully press with the tip of the iron. 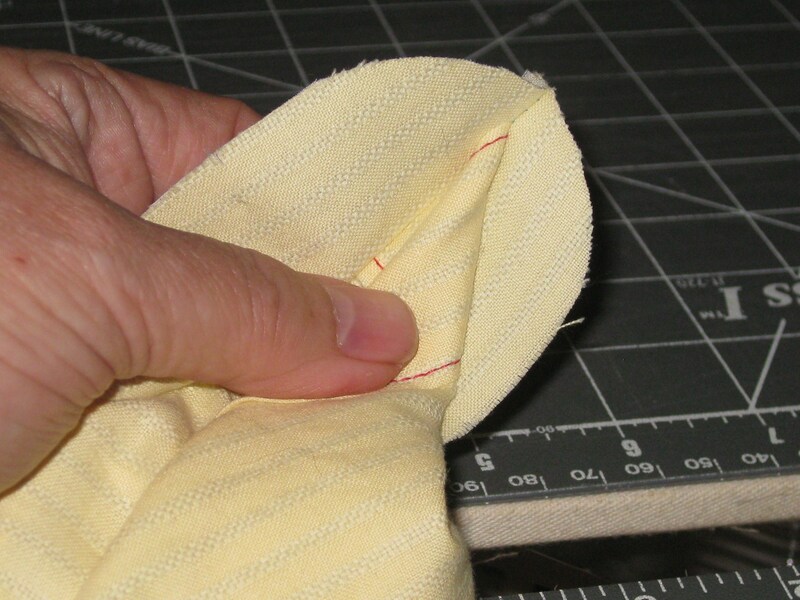 Turn in this edge and place the fold on the row of machine stitching. Pin in place and slip-stitch or tack in place before top stitching the stand. When making buttonholes, stitch buttonhole on inside of collar stand so that right side of buttonhole is showing when garment is worn open at the neck. Back – collar stand rolls nicely with no hint of under collar showing.